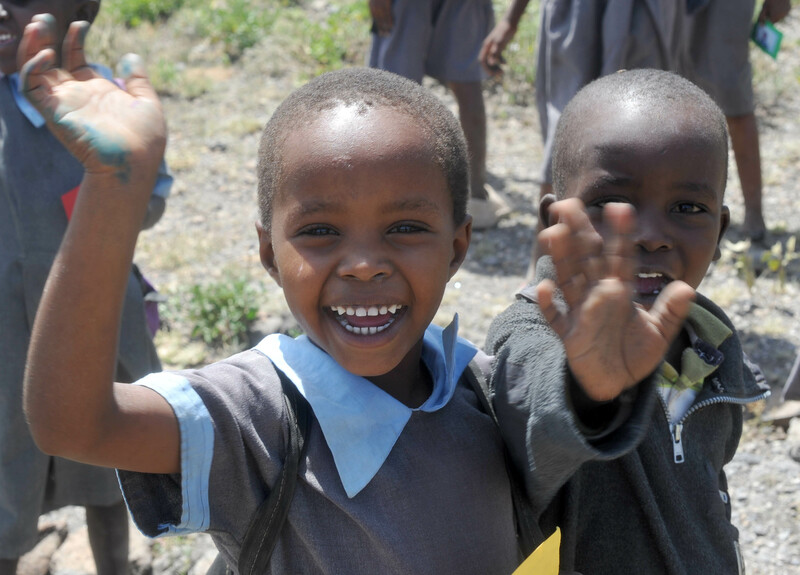 For the students: Brunswick, Maine students send friendly greetings to Maasai children of Kenya! Hello artists of Brunwick, Maine! 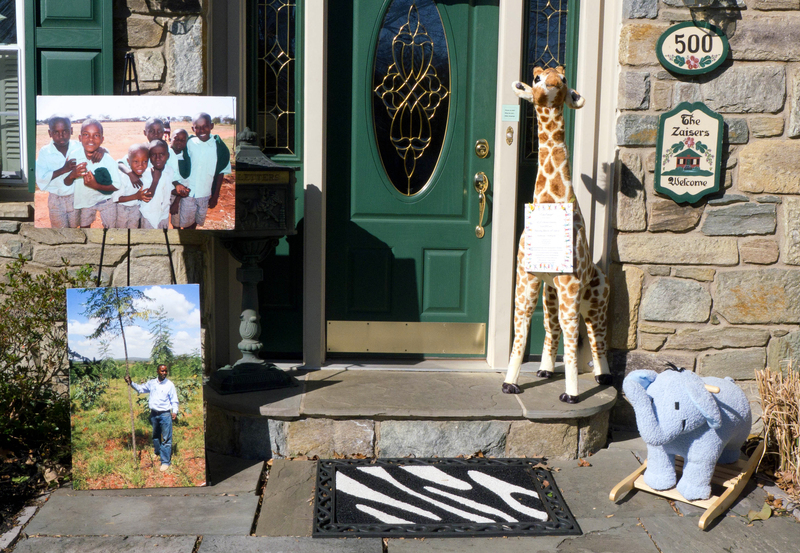 Your artwork and the donated art supplies have traveled a long way to make it all the way past Kiserian, Kenya where the Maasai children live. 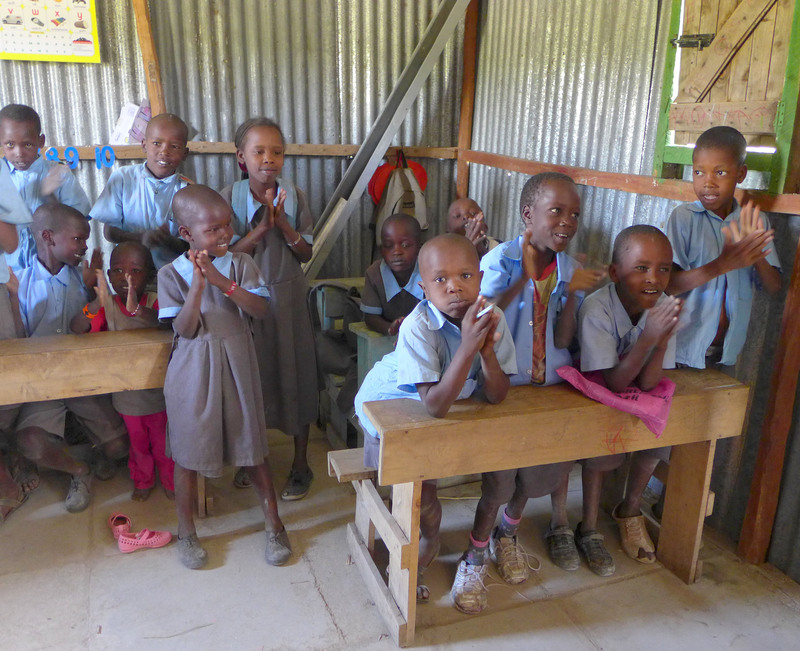 The children here and the teachers and parents of the community were VERY grateful to receive them! The trip to their community is about an hour’s drive from where we are staying and we traveled through the town of Kiserian and through some beautiful countryside. 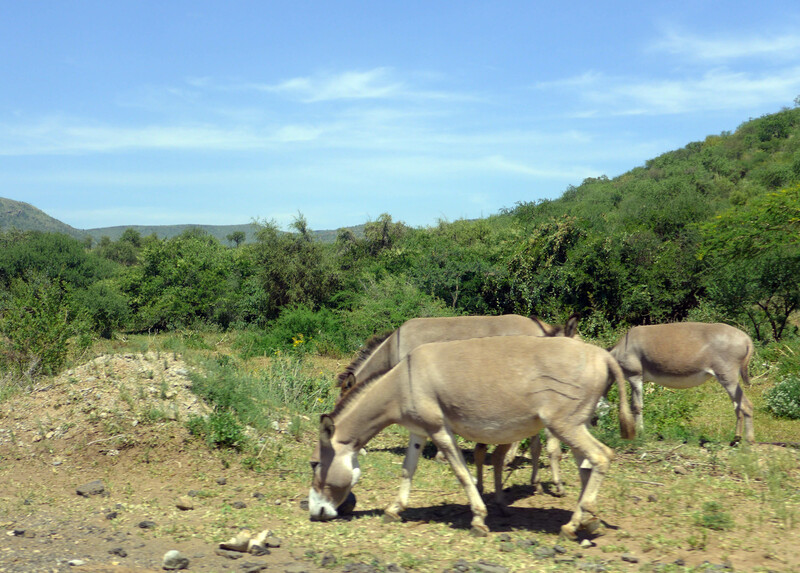 It was common to see donkeys grazing on the side of the road or to see herds of cows crossing the street and even to have to stop for them as they pay absolutely no attention to the cars sometimes even if they are being herded. Often they are roaming free when not in town. 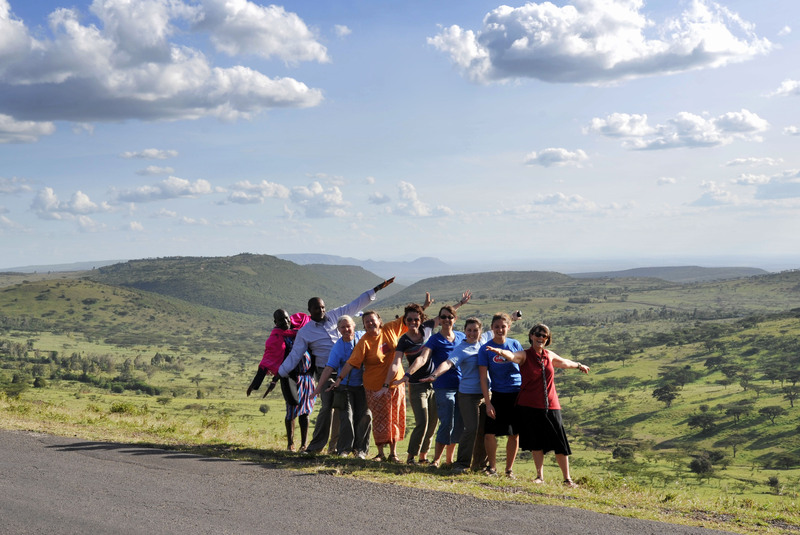 We traveled through the Rift Valley which I wrote about in my last post for you. When we arrived at the school the children were all very excited to see us because they know that we always bring things that will add to their classrooms and do special projects with them. They are very smart children who are hard workers and love to learn but do not have all the books and supplies which children in the U.S. have. 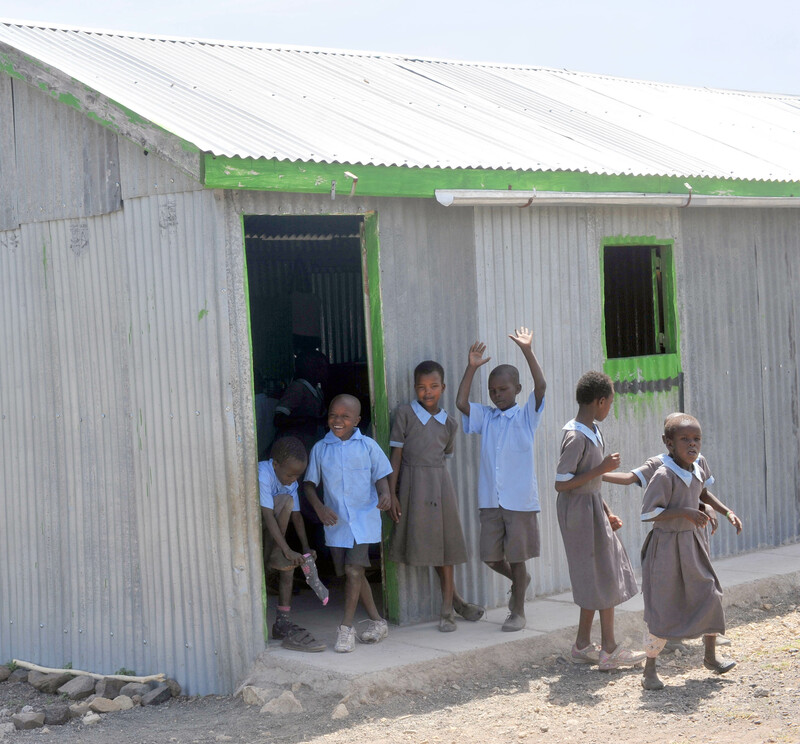 They have very few art supplies (maybe a few crayons) and their school has tin walls, a tin roof, windows with no glass, and until recently dirt floors. 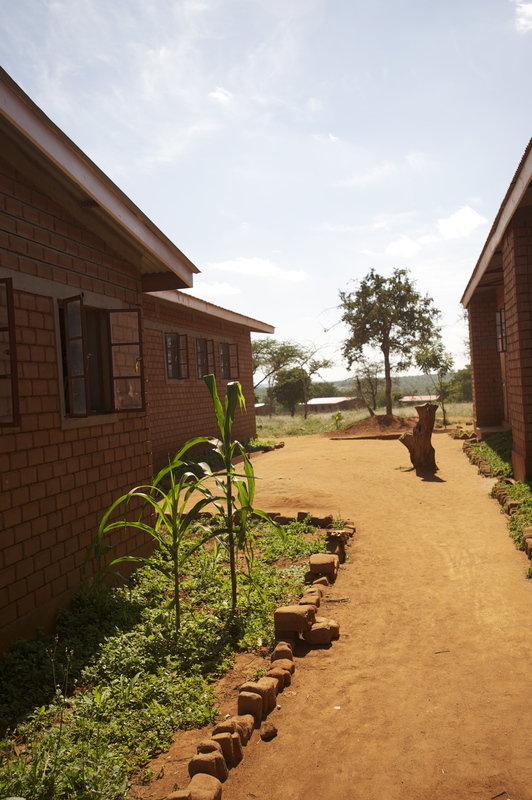 because of some donations they were recently able to make a cement floor on the school which has made it much better. 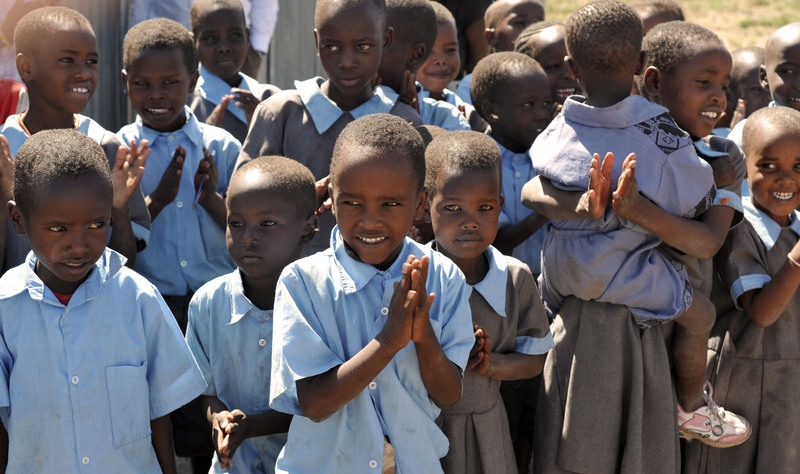 All children who go to school in Kenya are required to wear school uniforms so you will notice that they are all dressed alike in the photos taken while they are at school. Although much of the time the Maasai rely on milk and meat to eat, when there are enough supplies to make it, the children get porridge made out of corn flour, dried milk, oil and sugar for lunch. When we arrived they had run out of the supplies for making hot lunch so the children were getting any lunch. However, we were able to get them enough supplies to make sure that there would be lunch for them for the next year. 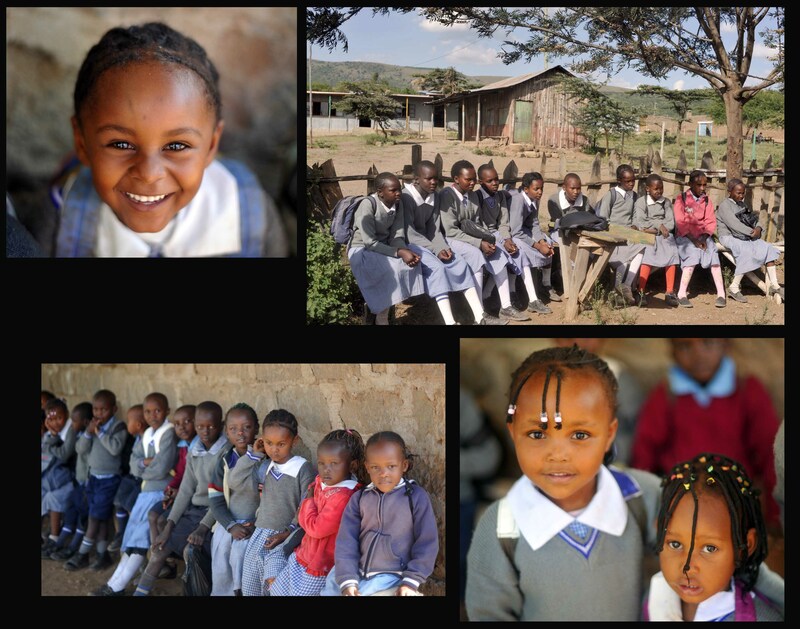 The homes that the Maasai children live in are very different from the homes that we live in and they often raise the baby animals of their herds inside while they are young to keep them safe from predators. 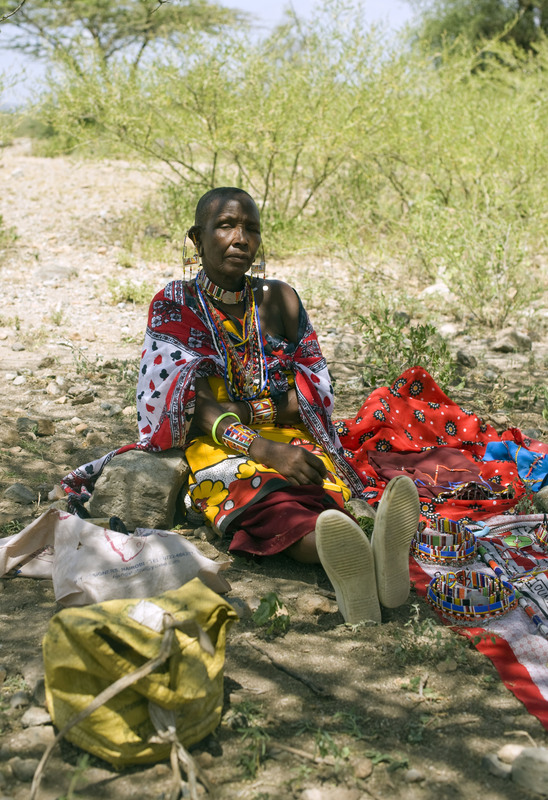 The Maasai are known for dressing in very bright clothing and wearing traditional tribal beaded jewelry. Even the very young children wear bracelets made out of beads. When I told them about your art, I explained to the children and the parents that it was a way to send friendly greetings from America and that part of my goal in traveling is to teach the children at home about the cultures of other parts of the world and try to connect them to each other I explained that your artwork had many friendly sentiments and that Mrs. McCormack had been talking to you about Kenya and the Maasai people. On the day before we had made masks with them so they had just been making masks. 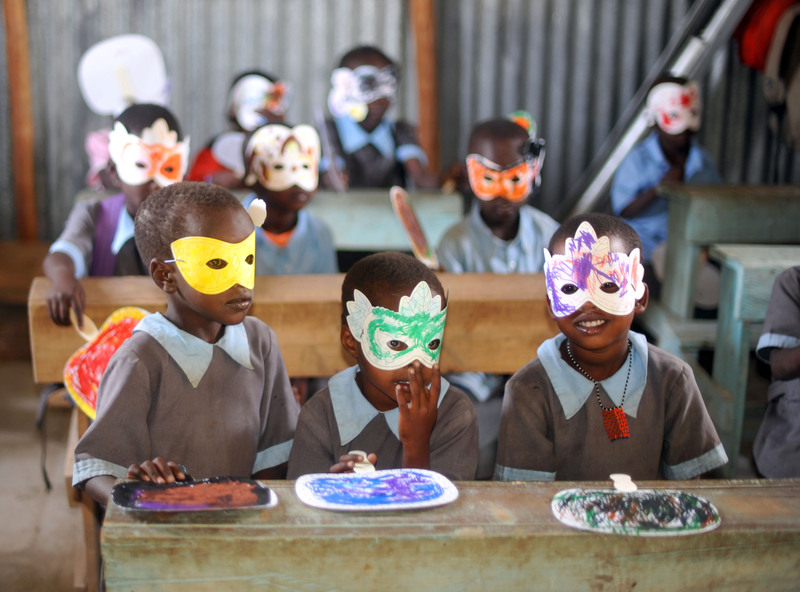 I shared some of the masks that came in the art work form some of you which made them laugh and clap! enjoying the masks you sent! I also explained to them that I would be making copies of the photos that I had taken of them the day before to share with all of you when I return to Brunswick. Since they do not have mirrors or any photos of themselves it was a special treat to take instant Polaroid photos of them and put them on a frame for them to bring home in the same way that you would have your picture taken at school. 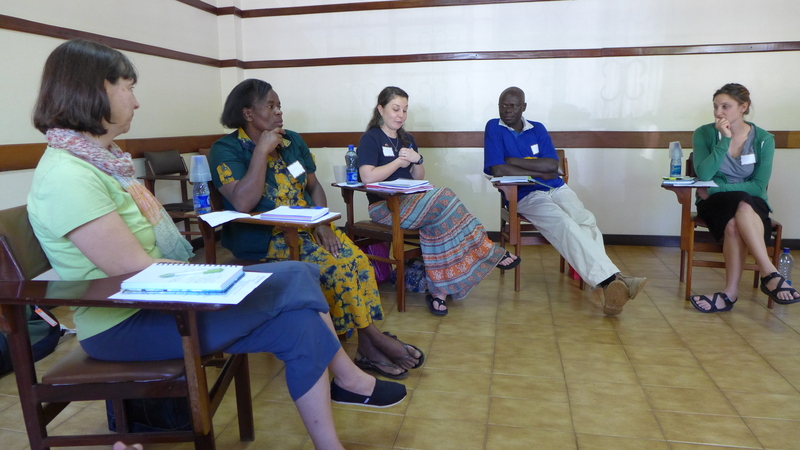 I am hoping that we might be able to continue this exchange back and forth as I go to Kenya each year in the future. 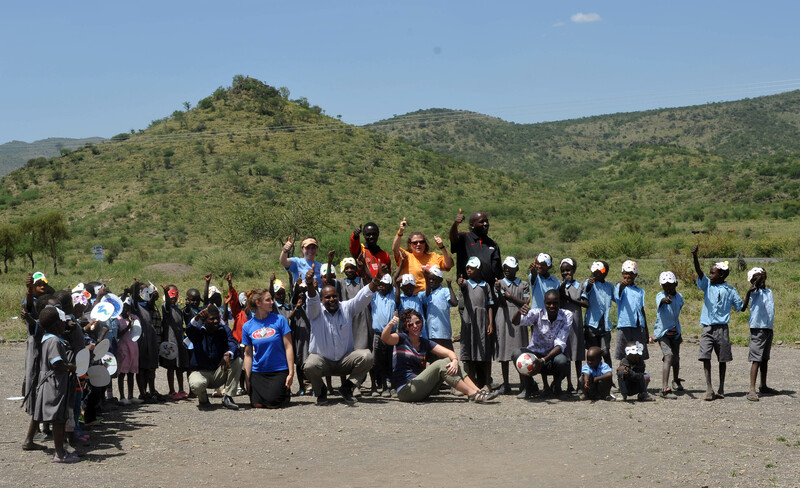 Although Many things about your lives are different, there is much more about you and the Maasai children that is the same and it would be a nice opportunity for you to learn more about that. A huge thank you to all the Brunswick, Maine artists and especially to Sharon McCormack for coordinating this with me!! We have been with the Maasai community of PCDA (Pastoral Care Development Alliance) for the past two days: we have loved and taught their children (and they have taught us), heard of their challenges and tried to help with some of them, sung and dance with beautiful Mommas and bought their goods, “broken bread” together and had a wonderful time of getting to know each other better. The ride to Kiserian and beyond to their community was rich with culture and beauty as we drove to the opposite side of the Ngong hills (remember in” Out of Africa” Karen Blixen says, “I had a farm in Africa at the foot of the Ngong Hills…”) with views of the Rift Valley. 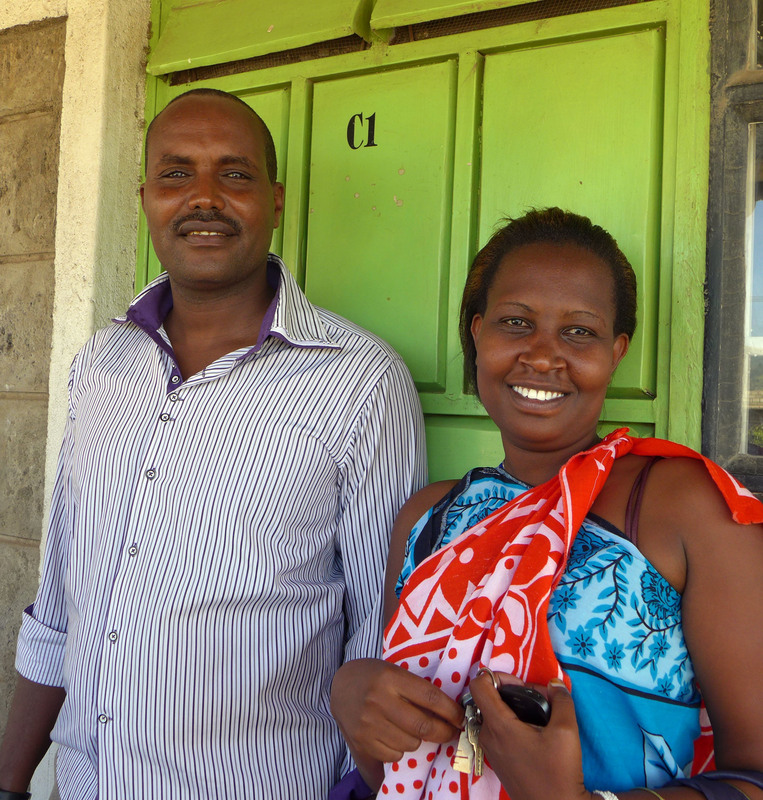 We met Philip and his assistant Kristen in Kiserian where we picked them up to drive with us to the community. We had already previously met with Philip one evening a couple of nights earlier to discuss the needs of the community and how best to support them. 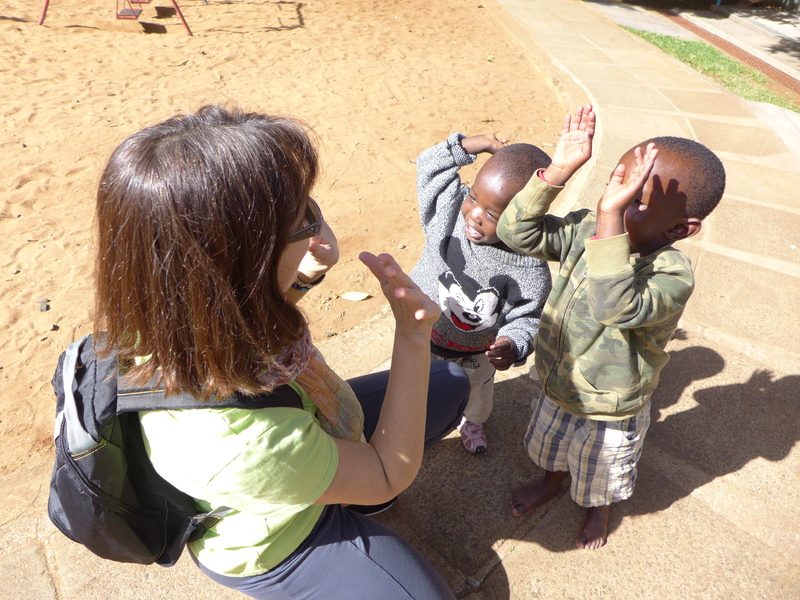 When we arrived at the school the children were all outside waiting for us with plenty of excitement and enthusiasm and then swarmed to greet us after we first drove by to use the facilities which were a little more welcoming (remember ALL is relative in Kenya) at the nearby church! Before we actually got to spend time with the children, we met with the chief and various other leaders of the PCDA community about our plans to offer support and to learn more about some of the challenges that the community is facing. 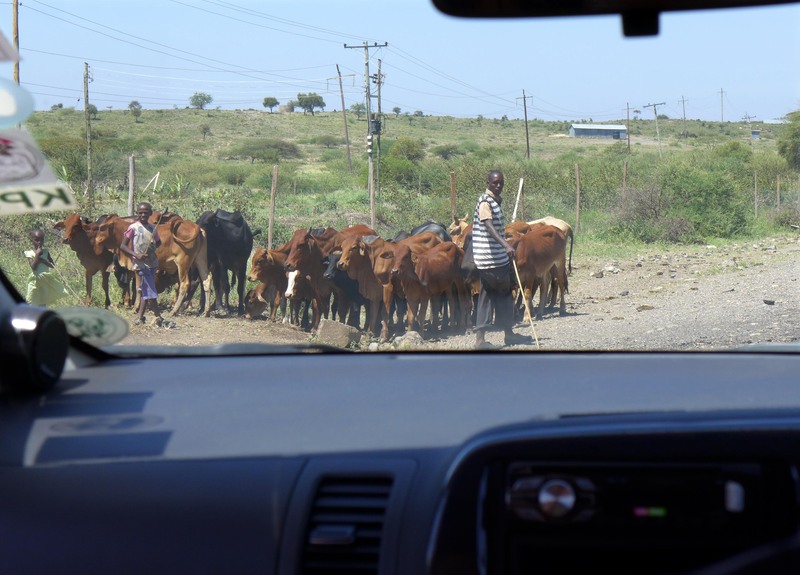 One of their biggest challenges is adequate water since they are pastoralists and rely on having herd animals as a constant source of milk and meat which are their main dietary components. Currently their only reliable source of water is that which is piped into the community from a bore hole owned by a company which charges them by the liter and it is very expensive, The overarching challenge is poverty so having to pay for water is a huge expense. 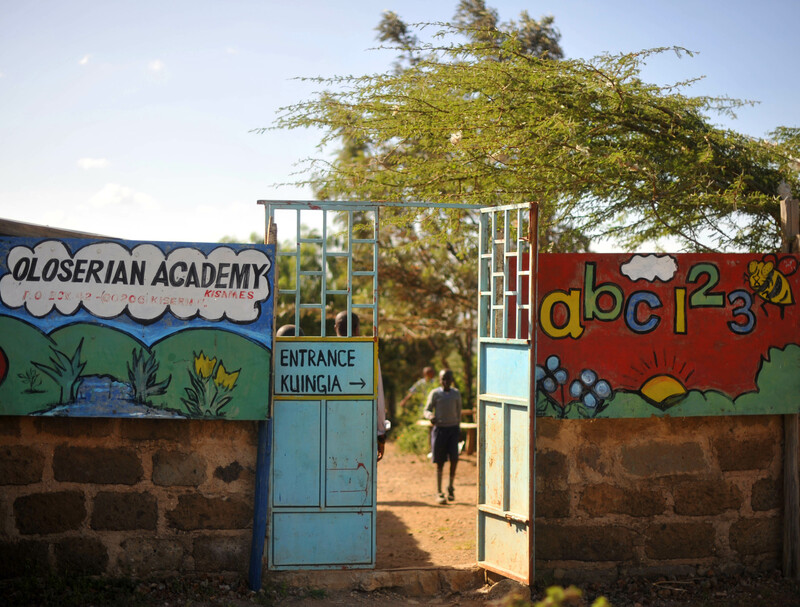 Since KEST has been involved they have been able to make improvements in their school such that they are not far from becoming a government accredited school which will offer them some federal funding and relieve some of the financial burden of running the school. They are very determined to properly educate their children and one very articulate woman got up and spoke about how the key to educating a community is educating a child and that her dream is that someday the Maasai women will achieve the equality that white women have achieved. 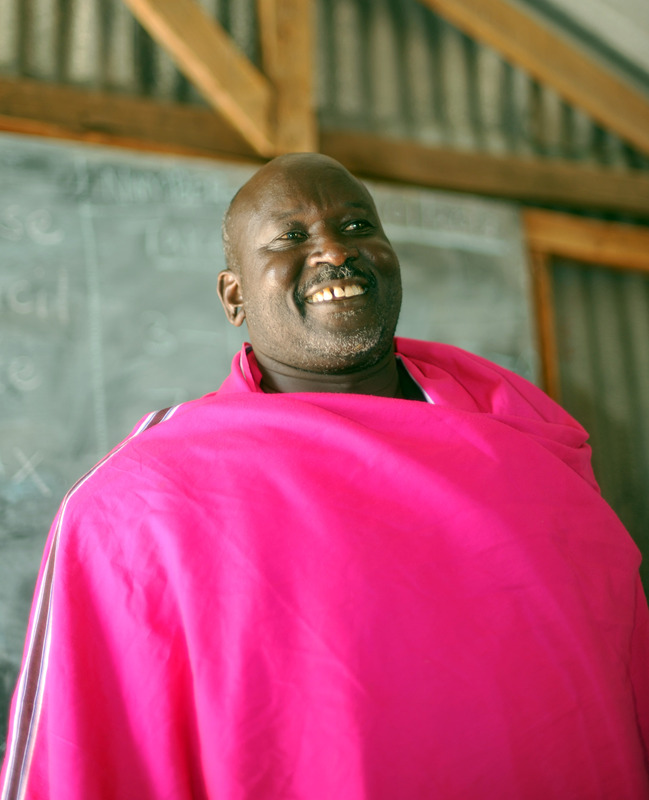 The traditional Maasai Culture is very patriarchal, but they are working to make some changes such as educating all children, not just boys, and hoping that their children can someday be leaders in the country. We did a number of projects with the children that morning: making fans, making masks, and I took a Polaroid photo of each and everyone of them to take home to their Mommas. I had the very helpful assistance of Karen as the camera was clearly not designed to work that hard all at once, but the children were so thrilled and so patient as they waited their turns. We will make additional photos like these to give to the children in Maine who sent their art work over to this community. While we were finishing up their photos, the rest of the children and the KEST workers and staff had a football (soccer match). We joined Philip, the Director, the teachers and staff for lunch under a tree with a wonderful, welcome breeze that offered some relief from the heat. We met a few parents of the children at the school through out the day but also went to the homes of some of the families in the afternoon. 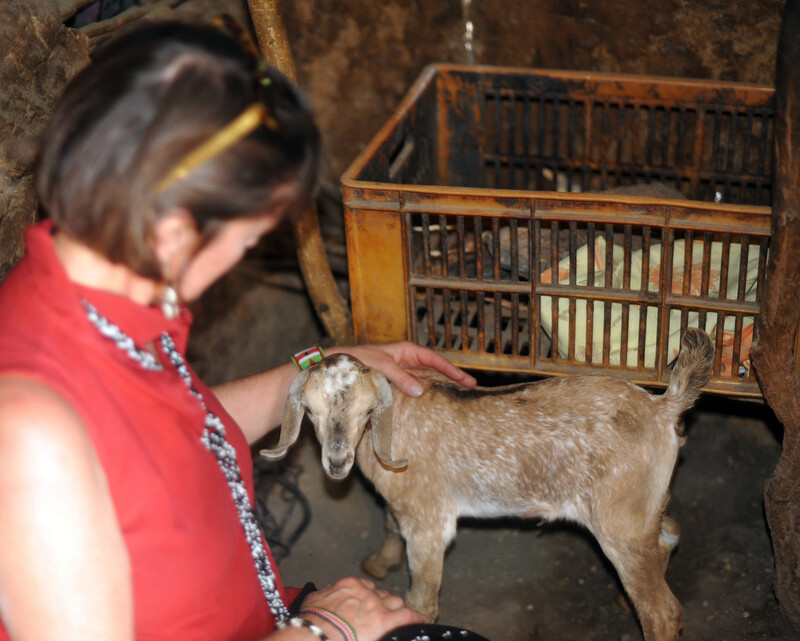 Baby goats are protected from predators inside the boma–I loved petting this one! 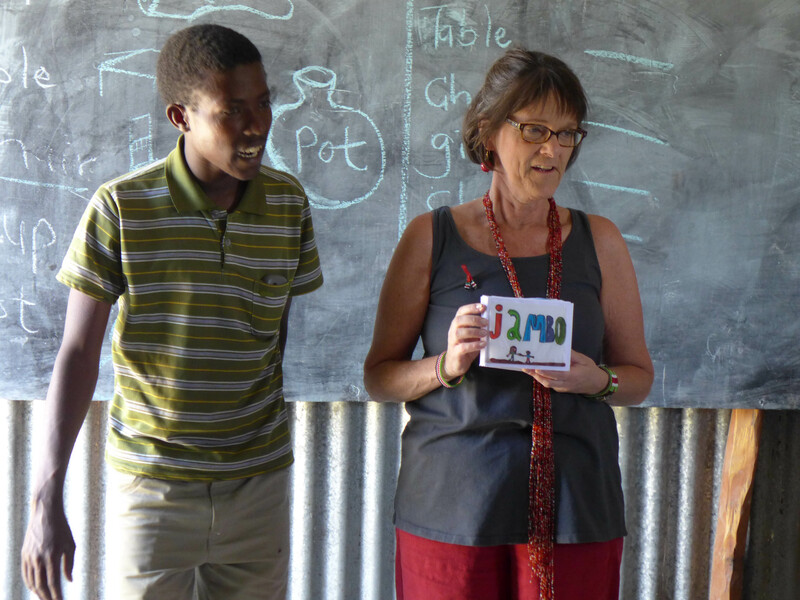 Having determined what were the most pressing needs of the community that we could try to address, before we left for the afternoon we made a plan to meet Philip in Kiserian again the next morning to shop for school supplies and the ingredients to make porridge. The children were no longer getting lunch at school because there were no supplies for making it. So we shopped for three months worth of porridge supplies and provided the funding to keep it going for the next year and committed to keep it funded in an ongoing way. We also shopped for all the school supplies needed to keep the school going and thanks to one of my generous donors we were able to order gym/sports uniforms for all of the children (Thank you Marie!). When we brought all of these things back to the school there were great expressions of gratitude from staff to parents and the children who just cheered about the sports uniforms! I also presented the art supplies and from the Brunswick, Maine students, but will write about that in a separate post for them. 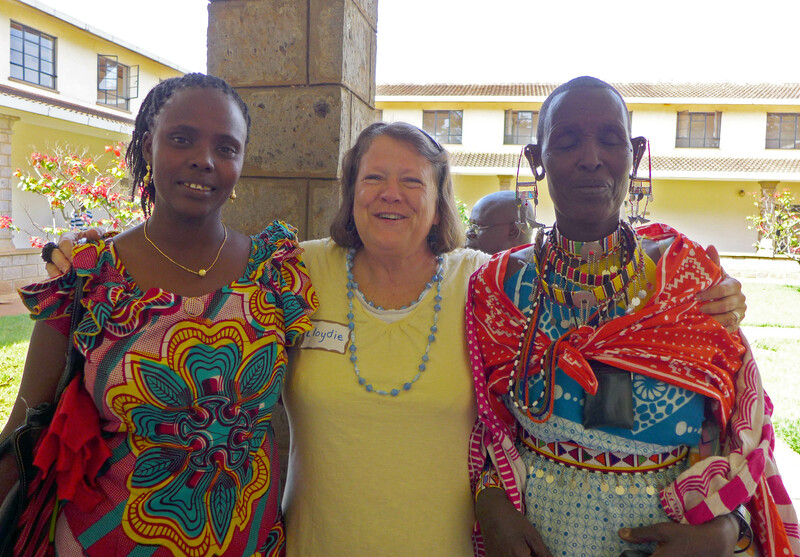 In the afternoon we met with the self-help group of PCDA, the Maasai women of Tuko Pamoja. We had the usual business meeting with Jane, who is a nurse in the group and one of several who has excellent English, who was able to translate for the other members. We presented them with the Membership certificate, went over the order, and paid them for the completed items. We also did interviews to get their personal stories of their lives. We had time to visit together, shop from the wares and play with a few children who were there. On “onlooker” taking everything in. 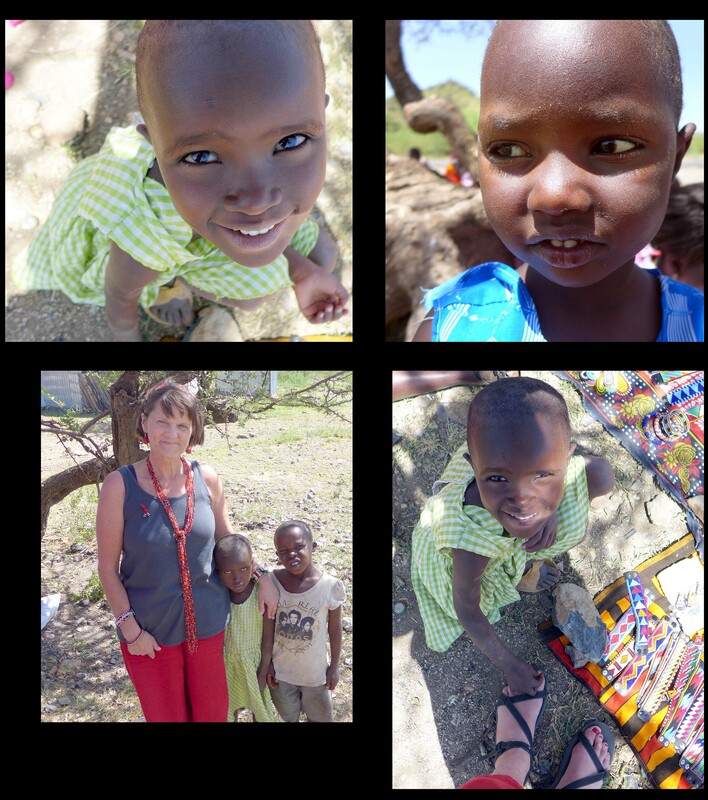 I enjoyed the Maasai children–especially sweet little Elizabeth who so wanted me to paint her toenails red too! 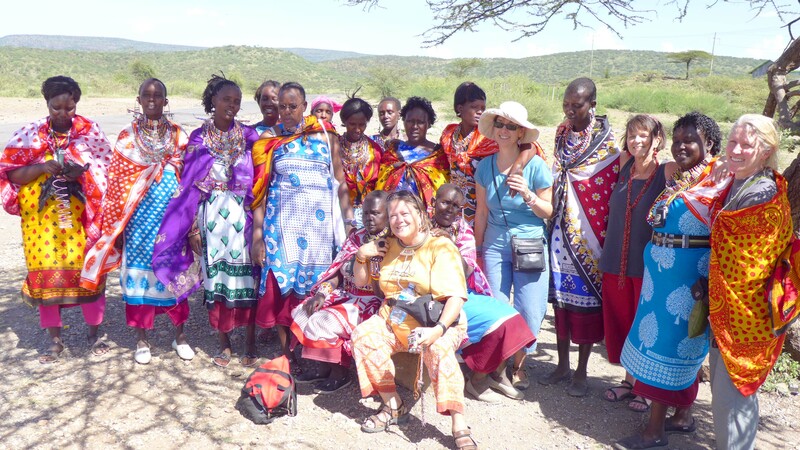 Before departing we spent time expressing mutual appreciation and in the welcomed cool breeze in the hot sun we all swayed together as the women sang beautiful traditional Maasai music for us under a clear blue sky. 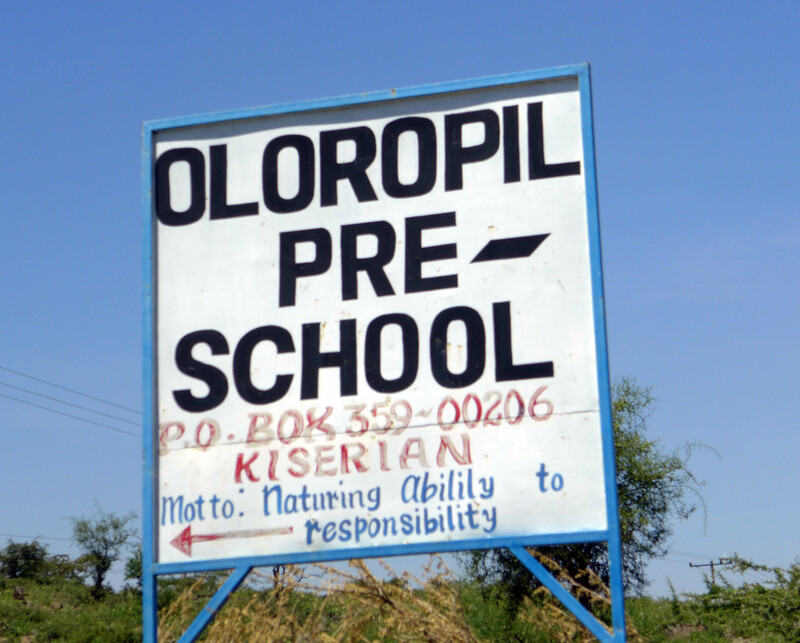 We headed back to home base at the Demise Sisters Retreat with a few stops on the agenda–one was a stop to meet the teachers at Philip’s son’s school because now he is in a different school because he has moved into Class 2 (grade 2) and can no longer go the Ororopil Preschool. When we arrived there, much to our surprise and extreme delight, a number of group members recognized this school from the movie, “The First Grader” , which if you haven’t seen I would highly recommend. It is a multi award-winning film which is the true inspiring and touching story of an 84 year-old Kenyan villager and ex Mau Mau freedom fighter, Kimani N’gan’ga Maruge, who fights for his right to go to school for the first time to get the education he could never afford. Since we had all but one seen the film (although Philip did not know of its existence) and were really touched by it we were thrilled to see the school where it was filmed, meet the teachers who had played a part in the film, learn about the filming process, learn how they taught the children not to look at the camera and paid the children for their participation. Sarah was so excited she was in tears as she sat in Maruge’s desk! So this was unexpected surprise, one of many that has occurred in our travels full of magical moments. 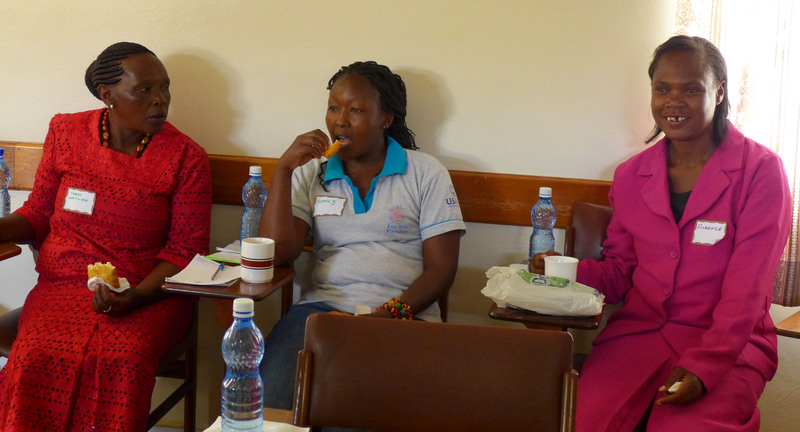 I am finishing up this post at the end of the day of the First Annual Tuko Pamoja Workshop for Women (I am behind on blogging because I have a nasty cold and there is only so much you can fit into a day!) But stay tuned, because THIS day, the workshop, was pure magic! We have arrived…and had a busy first day! Finally in Kenya!! We arrived late last night, close to midnight, after being delayed nearly two hours on the plane in London while snow was falling and the plane was getting deiced and desnowed. We were lucky to be on the early side of that snowstorm as subsequent flights were cancelled and we were so ready to finally be here! We were greeted by the warmest of smiles, hugs and shouts of “Karibu Kenya!” by Justus, our favorite, always good-spirited driver who delighted us by telling us that he would be our driver for the whole trip. 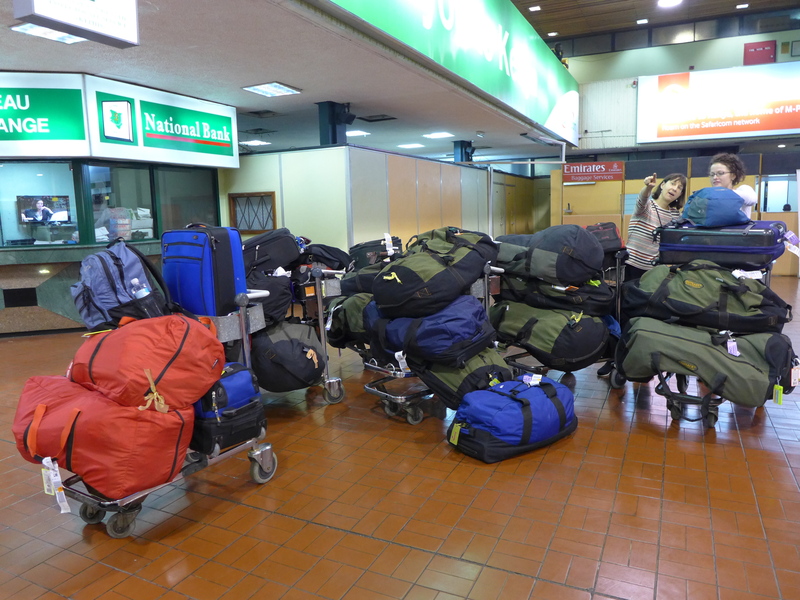 We had 34 suitcases and duffels to collect before heading off the Dimesse Sisters, our lodging, where we arrived well after 1AM and got just organized to get to bed. After breakfast at 8, we reunited with Justus and were off to Nyumbani Children’s Home. 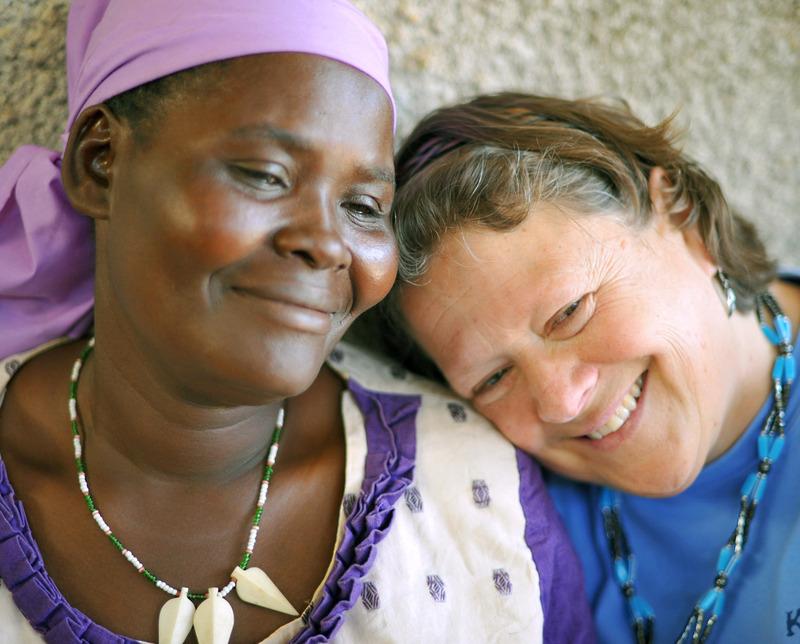 We were headed to a meeting with Sister Mary Owens, the Executive Director of all the Nyumbani Programs, but of course met up with other staff and many smiling children and delivered many hugs along the way as we promised that we would be back all day tomorrow to spend time with the children. it is amazing to see ho much they’ve all grown! 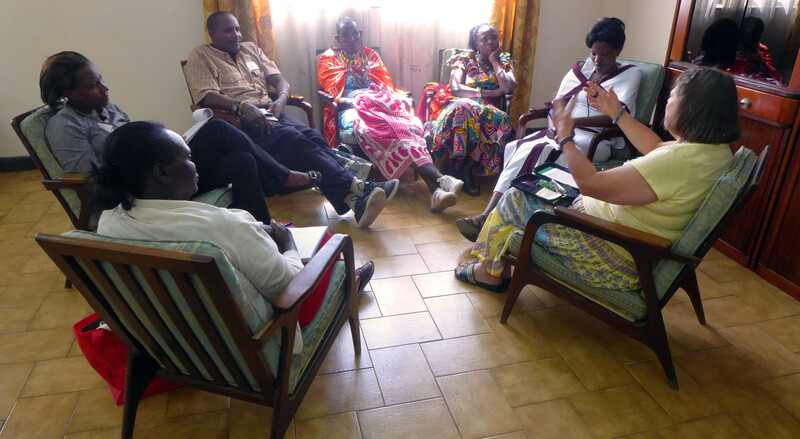 We met with Sister Mary to get an update about all of the Nyumbani Programs, to talk about various projects in which we will be involved, including the status of the chicken coop project and to talk about the plans for Tuka Pamoja while we are here. Tuka Pamoja is the company which we began to support the kenyan women artisans group who come from extreme poverty, the majority of which are connected to Nyumbani by either getting services through the Lea Toto programs catering to children who are HIV+ in the slum areas around Nairobi or by living in Nyumbani Village and being grandparents who are raising AIDS orphans. Sister Mary has been very supportive of Tuko Pamoja and the need to support the caregivers in addition to the children who are the primary recipients of support through Nyumbani. Following a productive conversation and pleasant visit as always with Sister Mary, we were off to get ready for the first annual joint meeting between the U.S. and Kenyan Boards of Tuko Pamoja. Since this was the first time all of the U.S and Kenyan board members were together it was quite a thrill to be able to talk about how exciting it is that the first year of TP has exceeded our expectation in sales and enabled us to place an even larger order this year, to be planning a workshop for the women and to think long term about how to involve more women’s groups and to ultimately work towards helping the current women’s groups become self sustaining. There was a lot of excitement and synergy of good ideas in the air. 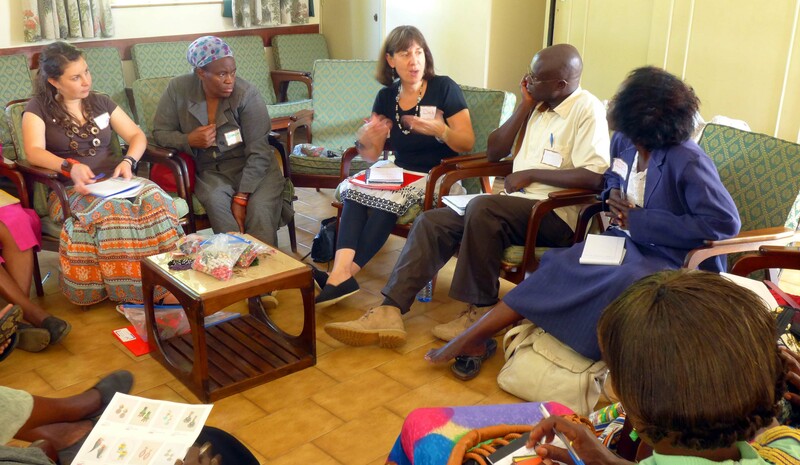 We planned the Workshop for Women for next Saturday by working in pairs of one U.S. Board member paired with a Kenyan Board member of similar skills and I think we have a marvelous workshop planned! I got to spend some time with Lilian, yes, the counselor I usually work with at Nyumbani Village, and we came up with our portion of the workshop through which all the artisans groups will rotate next week—personal well being focused on self esteem, self care and nurturing, stress management, female identity issues, etc. The women will also have a chance to learn about finance and business, product development and marketing and much more. 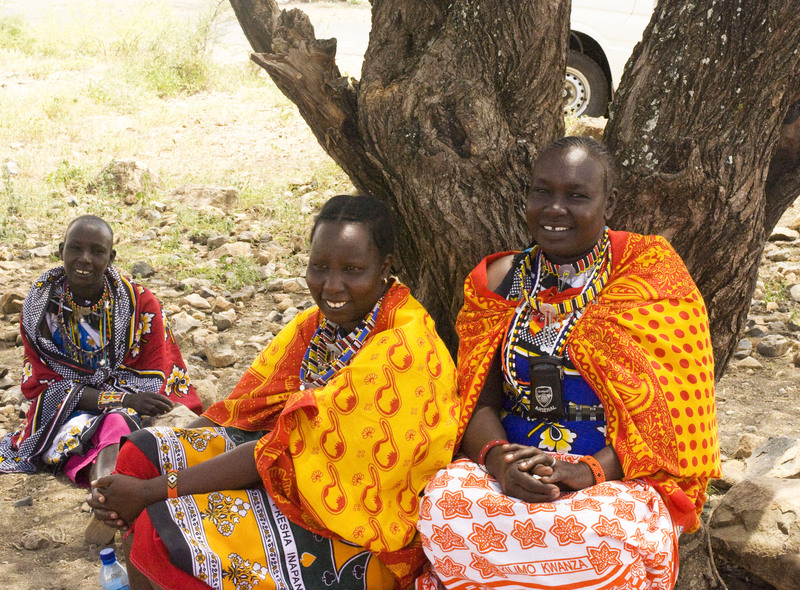 The goal of Tuko Pamoja is to help them have a sustainable income, but it is also to foster resiliency, an investment in the future and hope, a positive identity and pride, and a strong sense of valuing themselves and being valued. Its exciting and an honor to be part of this. 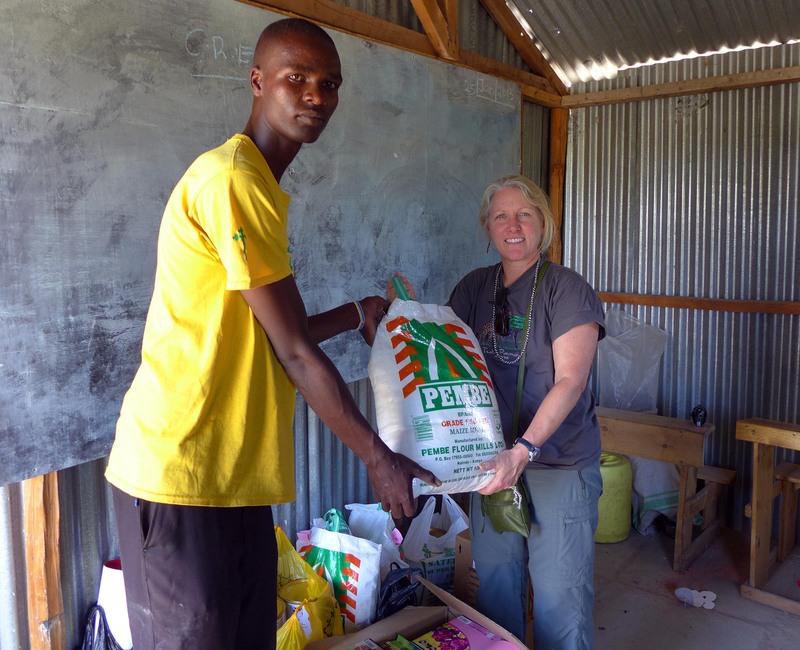 Chicken Coops, Chillin’ Mommas, Chirping Children …and Ugali?! You see… part of my goal in including these in the post is the hope that I might entice some potential interested volunteers for future trips (some of you already know who you are). I want to tell you about some of the plans that we have in place so that you will have a preview of what we will be doing. Though we are departing from the States on Thursday the 17th, we don’t actually arrive in Nairobi until late Friday night. We might be exhausted, but I can tell you from experience that excitement will make us early risers and we’ll be off and running on Saturday morning since it will the first time waking up in the daylight in Kenya. 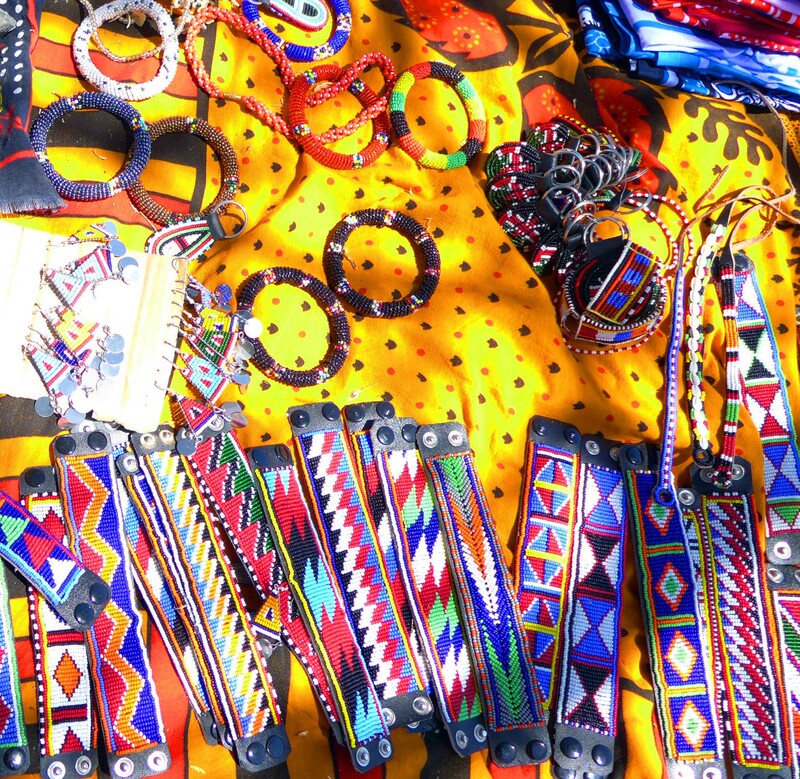 One of the major goals of this trip will be to focus on Tuko Pamoja, our collaborative business with the Kenyan women artisans and that will begin right away by having a joint U.S. and Kenyan Board meeting on Saturday and dinner together on Saturday night. 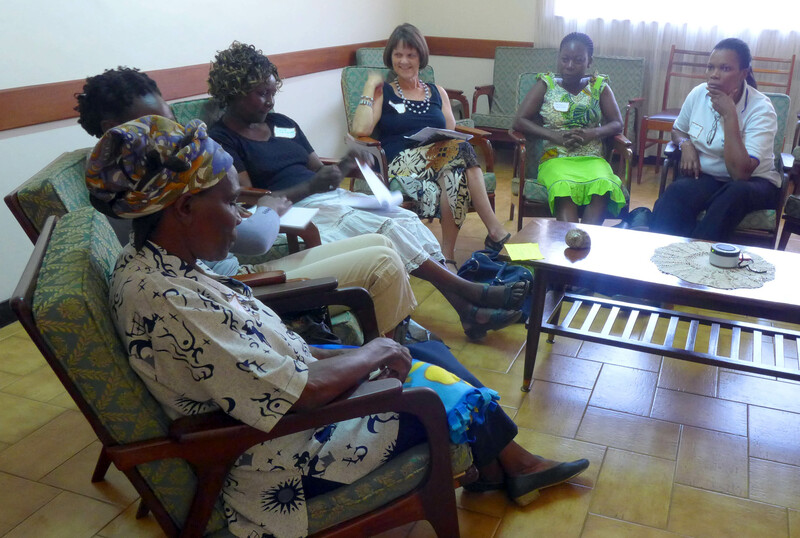 Now it might seem like a Board meeting sounds stuffy, but you have no idea—I’m talking about 10 people, all friends, half of whom haven’t seen each other in a year, 9 women and one man, who have enough passion about the Kenyan women artisan groups to blow the roof off the building. It could be problem that we are meeting in a sedate retreat center run by nuns…. Part of what we will be preparing for is the following Saturday we will be offering the first annual Workshop for Women for the Tuko Pamoja artisans. 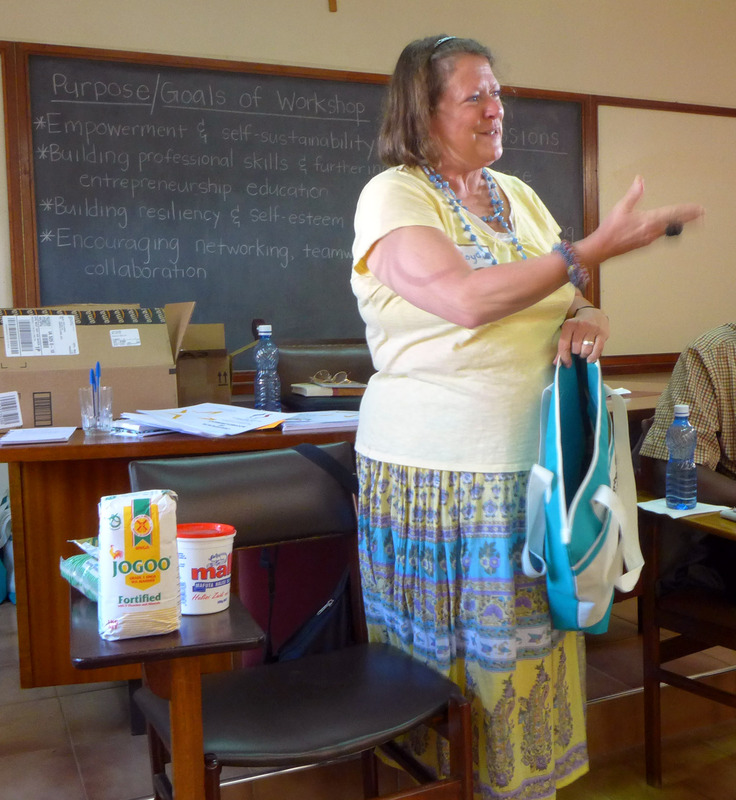 It will be their opportunity to participate in a workshop focused on product development and quality control, financial and business skills, personal nurturing, relaxation exercises and self-esteem (my part with my Kenyan Board counterpart, Lilian, the counselor from the village) and much more. We will have a lot of fun with them, a lot of positive feedback and skill building, new business cards, food bags for them to take home, and some personal items, some great bonding time and I am sure much singing, dancing, and probably some tears of only the best kind. The workshop will be after a week of going to all the sites where the women work to make their crafts–to the slums of Kibera, Dandora, Kangemi, and Kawangare where the Lea Toto outreach programs of Nyumbani provide services to families of children with HIV, and to the Maasai Community of the Pastoral Care Development Alliance. 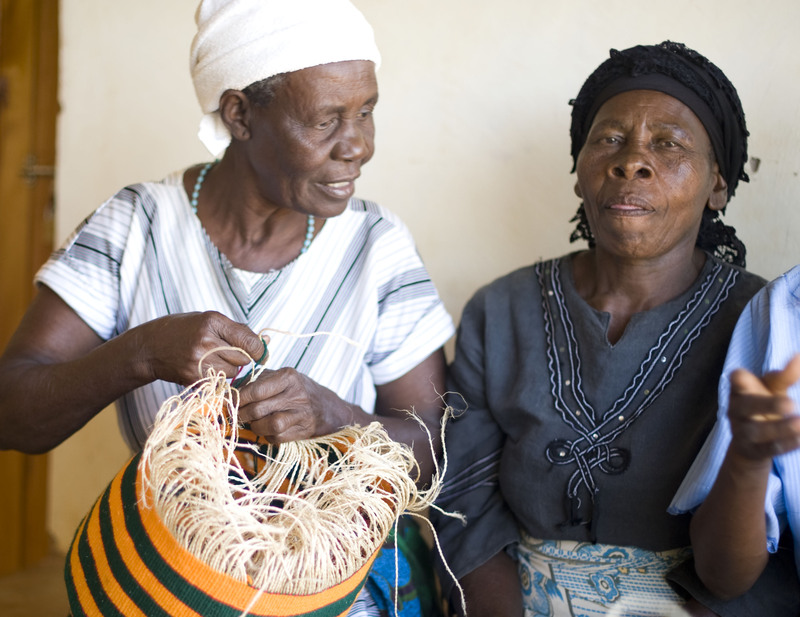 The only group which we will not see before the workshop is the basket weaving grandmothers of Nyumbani Village, but we will see them when we spend all of the following week in the Village. While we go to each site we have some other activities planned which will include outreach visits with the social workers to homes at the Lea Toto sites. These are always amazing touching experiences. 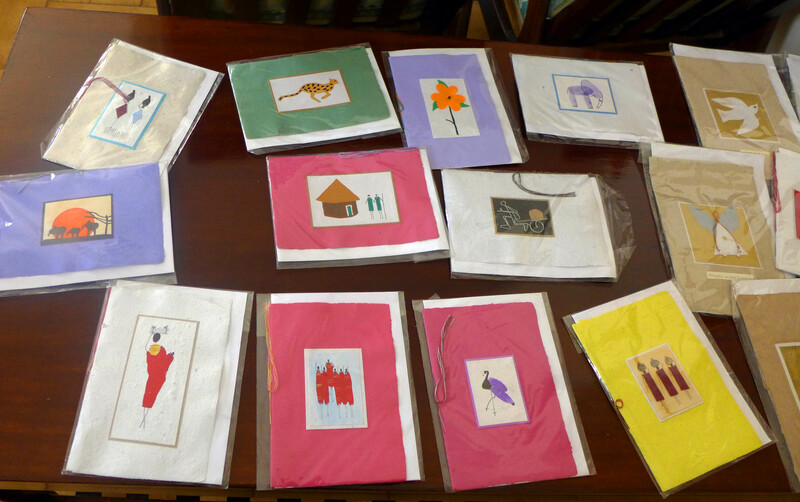 At Kibera paper we will do another workshop with a shared art project for new card ideas. 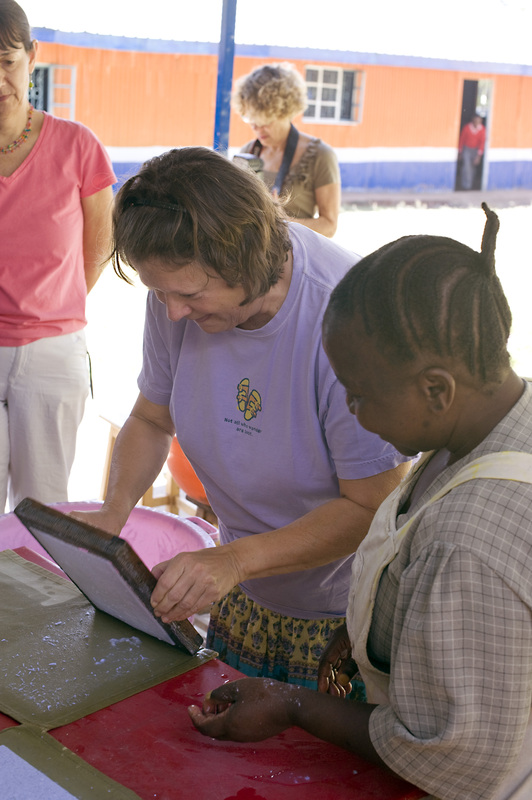 Last year I taught the women how to block print and had a wonderful time. This year I don’t have a plan yet but know I will and we will have a lovely touching time together. It will be a little bittersweet though as Hilder who so patiently taught us to make paper passed away since we were there last year. These women are so lovely, friendly and warm and so appreciative of the time we spend with them—of course that’s true of all these groups. 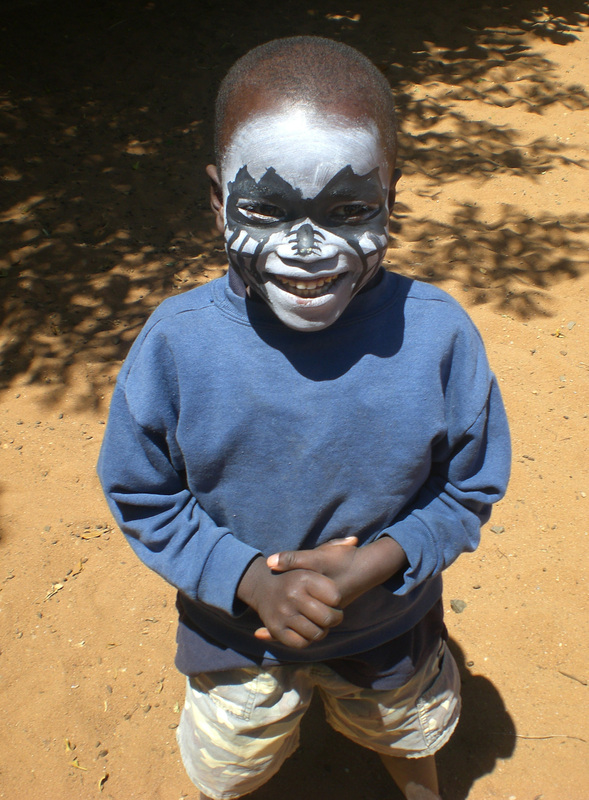 We also have some fun things planned with the Maasai Children at PCDA. 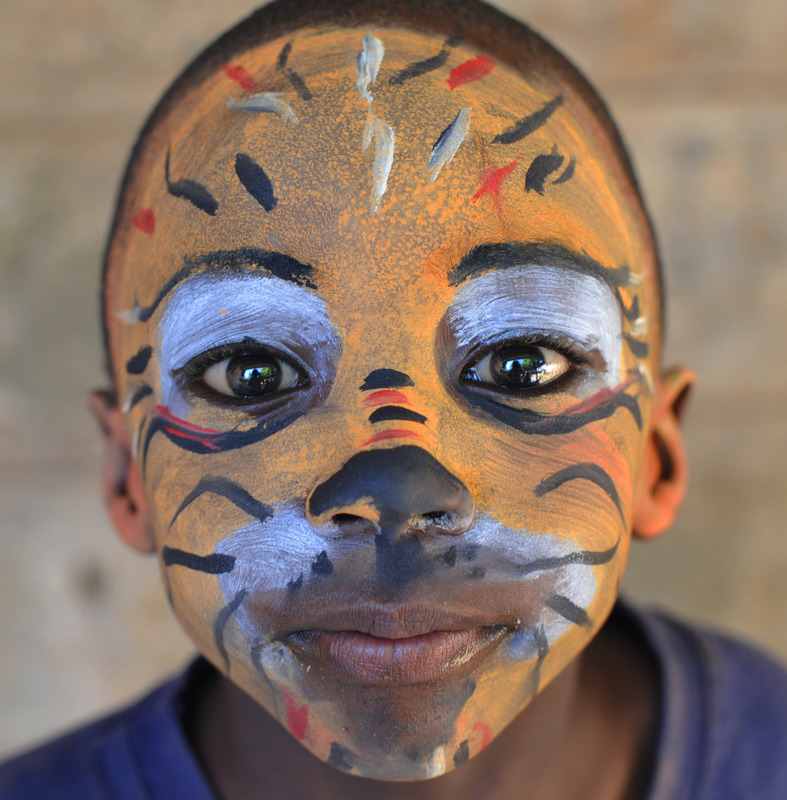 I have to say that I had a wonderful time with them last year and I think that was partly because I got to paint their faces and I was assigned the volunteer “task” of being the photographer. Well I have managed to weasel my way back into that assignment this year by coming up with an actual photography project. We are going to make “school photos” for the children to take home. 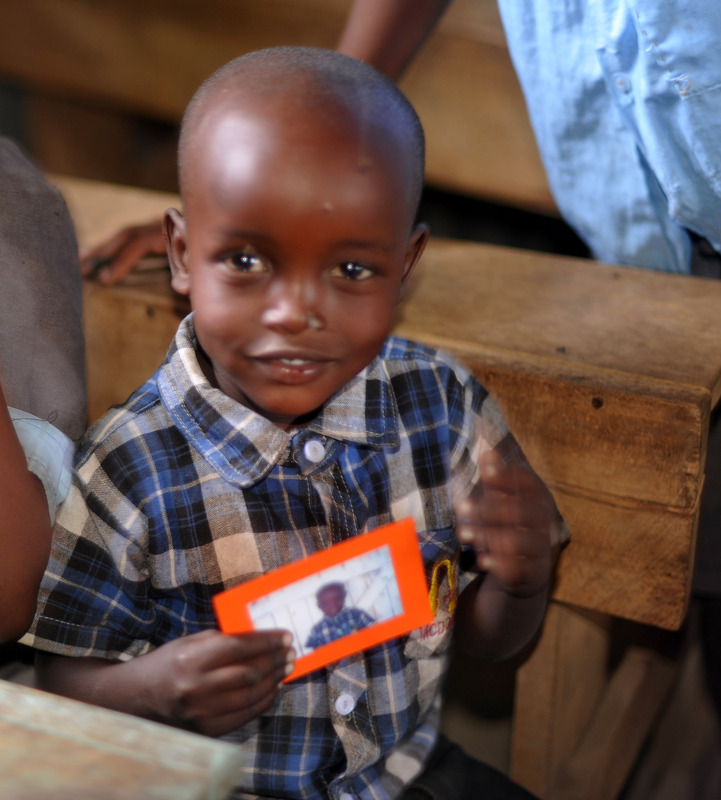 I have a polaroid digital camera that takes instant sticky back photos that we can mount on matte and these children who never have photos of themselves and are fascinated by the camera will bring photos home to their Mommas! 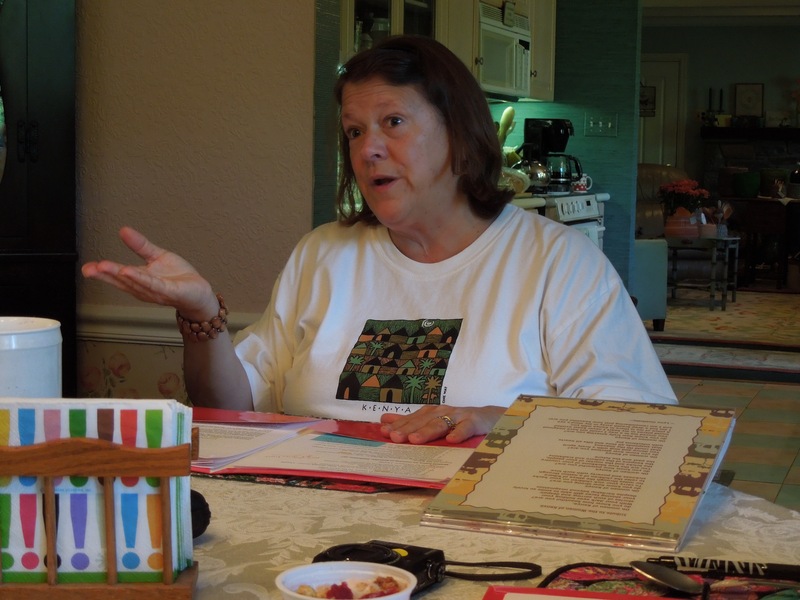 I have also been in contact with the local art teacher , Sharon McCormick, who did the art exchange with me back in 2010. She now teaches the gifted and talented art class and her students thorough the “Art of Giving” project are going to send art work and art supplies for me to bring to the children. Lloydie can we fit in a little art work project with the PCDA children 🙂 ? 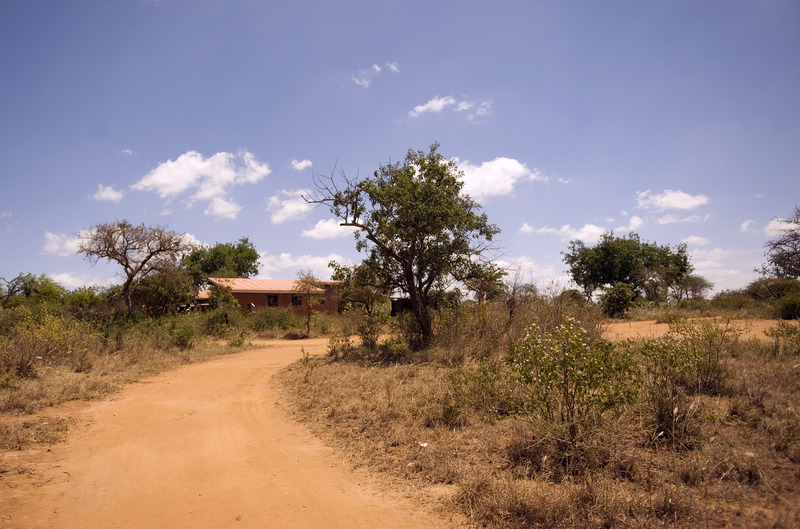 We head to Nyumbani Village for the second week and though living in the Village is rural and rustic and HOT, with lots of ugali (very heavy traditional Kenyan maize porridge that drops into your belly with a bang) at most meals, it is the most magical of the places we go. It is beautiful with lovely foliage and red Kenyan soil and smiling green clad children around every corner. The nights are cooler with the starriest sky you will ever see and if you are not treated to an up close and personal performance of singing or dancing by one of the families then you can often hear singing in the distance. We will be working on any number of things there. 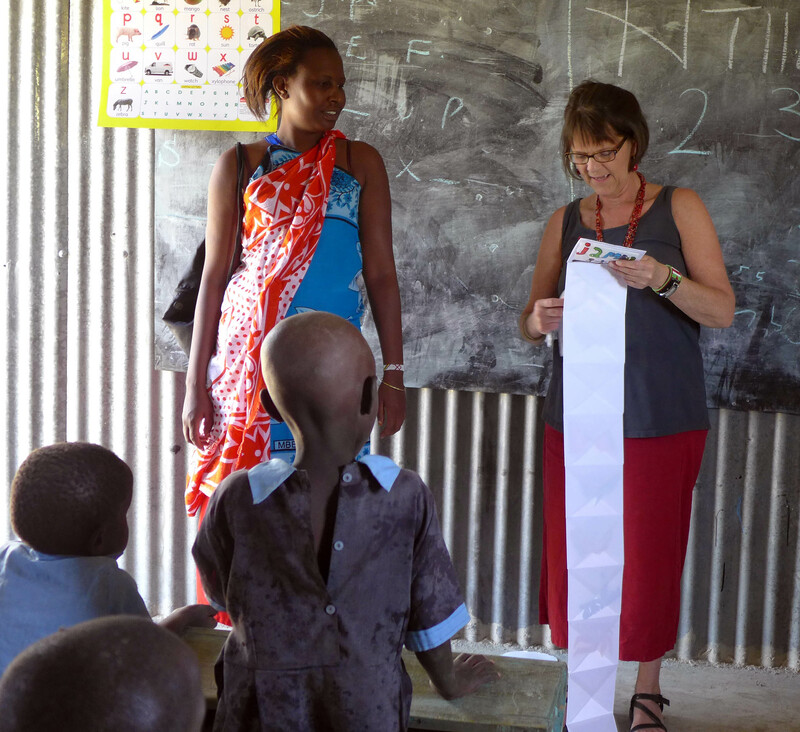 My primary focus is to work with Lilian, the sole village counselor for all 1000 children, 100 grandparents, the staff and community workers. 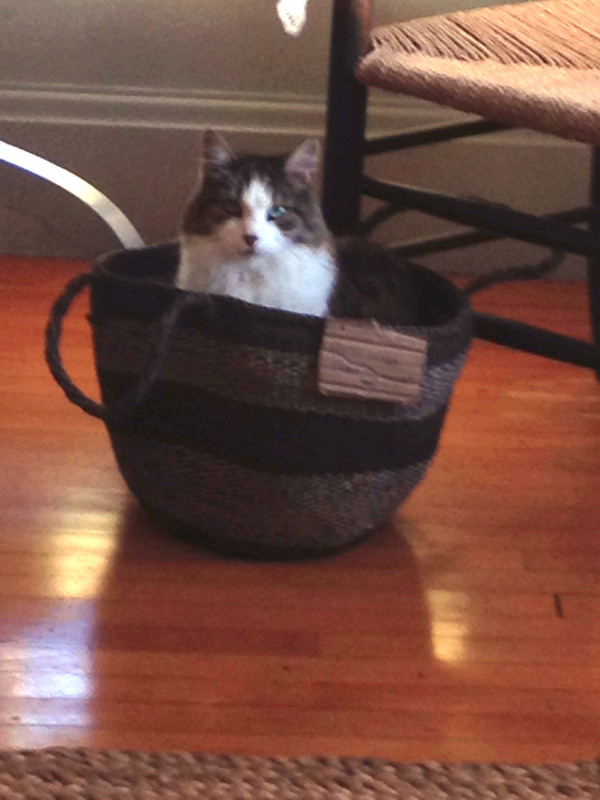 There are no psychiatric services available. Lilian already has people chosen for me to see, gives me the key to an office and I get to work. I don’t think she has any idea what hours I work at home because around midday she will tell me I am working too hard and bring me chapatis and a drink. The KEST Volunteers have been working on memory book to preserve the history of the grandmothers or Shushus and one of my other projects while in the Village will be to work wit a group of children on art for the memory books. Lilian doesn’t yet know she has to share me in the afternoon and I might find it hard to pull myself away if there are too many people in need. There will be a lot of simultaneous projects going on with volunteers participating in various different activities at the Village. And then there’s the chicken coops. One of the big request from Nyumbani Village was funding and help with 100 chicken coops. This makes so much sense since having eggs will be a very self sustainable way to increase dietary protein and the village is all about sustainability in remarkably creative ways–like growing tilapia and filtering the tanks through a vegetable bed (aka aquaponics), using biodeisel (methane from cow manure) to fuel the stove, and using human urine to kill the termite hills. But when will we fit in the chicken coops?! 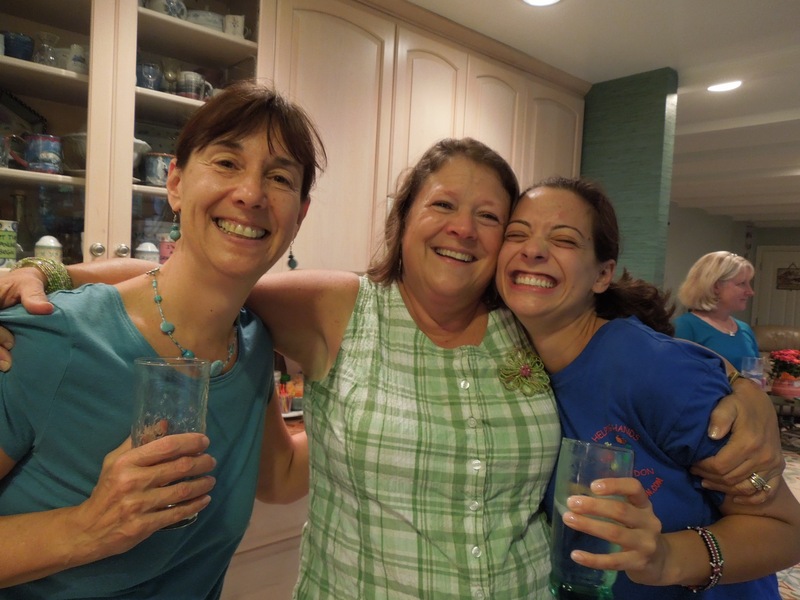 We always plan a special time to visit with the Shushus and they think they are teaching us to dance when really we don’t have a chance of ever dancing like they do–not in a million lessons! But we have a lot of fun! There will be plenty of time to mingle with the children and I will get to visit with Caroline the student I sponsor for high school. Children are always out walking back and forth from school, gathering kindling in the evening, or just coming up to greet you. 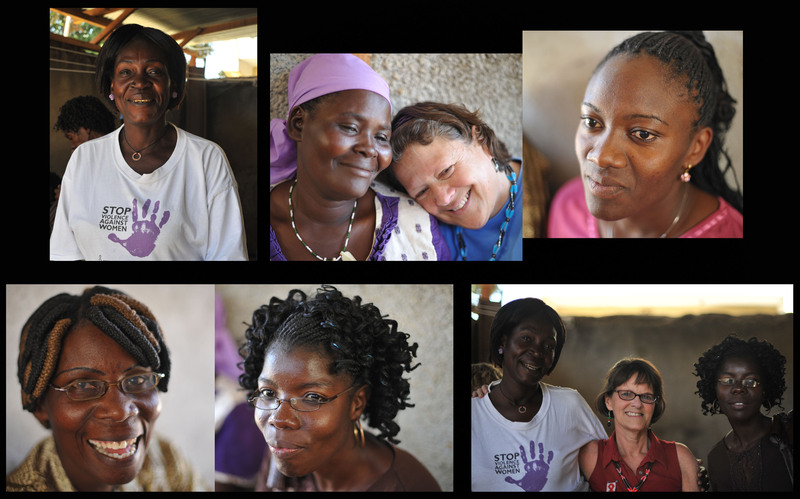 They loved to be photographed and to have your attention and are wonderful reminders of the success of this program. 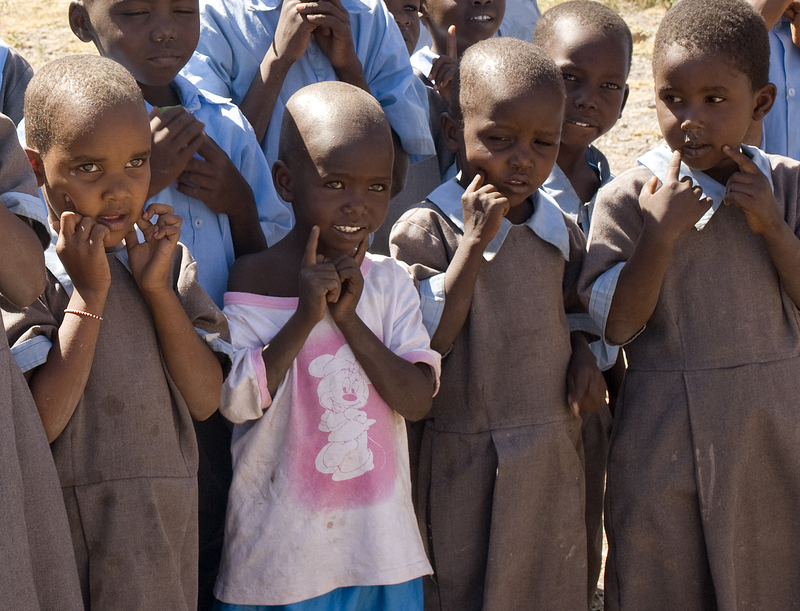 They are all AIDS orphans many of whom were rescued from unthinkable conditions after their parents died and now they are thriving healthy children. In fact the Village recently got international media attention for being a unique and successful model for raising AIDS orphans. news.yahoo.com/kenya-village-pairs-aids-orphans-grandparents-165643122.html One thing though that is always difficult is saying good bye at the Village. That is why last year I had to decide before I even left that I would be back this year and every year. 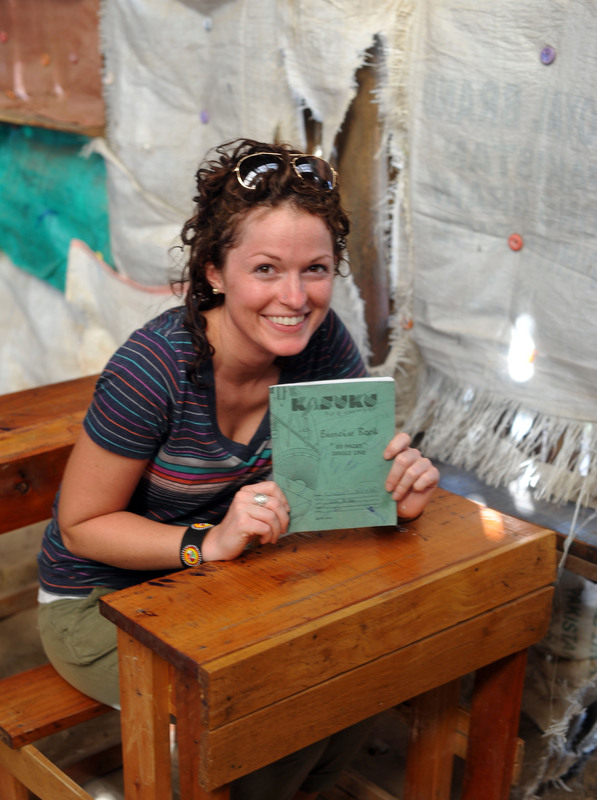 Returning to Kenya….in just 41 days! In some ways in feels like a long time since we left beautiful Kenya and in other ways it feels like we just said goodbye. In the almost year since I’ve been there, much planning and work have taken place to get ready for this trip and of course our amazing leader Lloydie Zaiser and her fabulous sidekick Jen Geiling have put in an enormous amount of work not only planning this trip, but also Lloydie led a multiple week trip to Kenya over the summer. 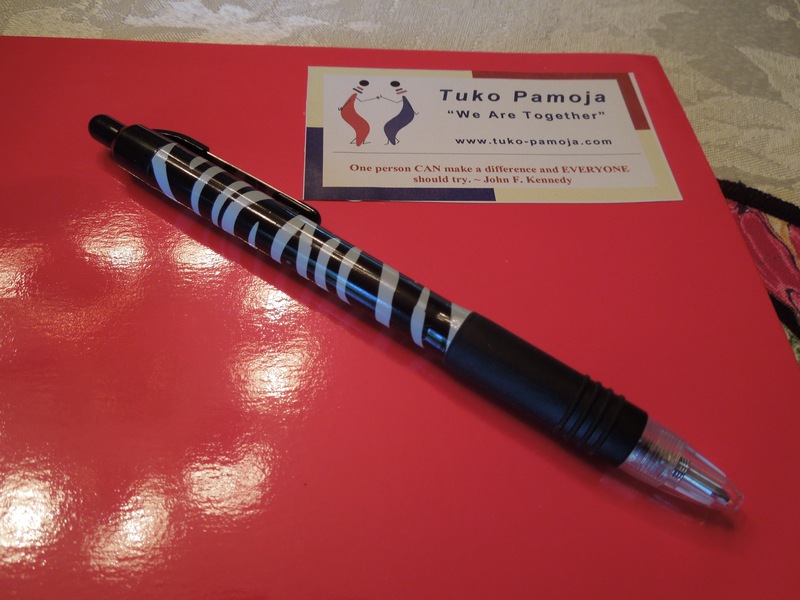 We have been hard at work planning our activities for Tuko Pamoja which in its first year has been a success beyond what we had hoped. In fact, the order has already been placed and the women are working starting to make the items now. For next years sales. 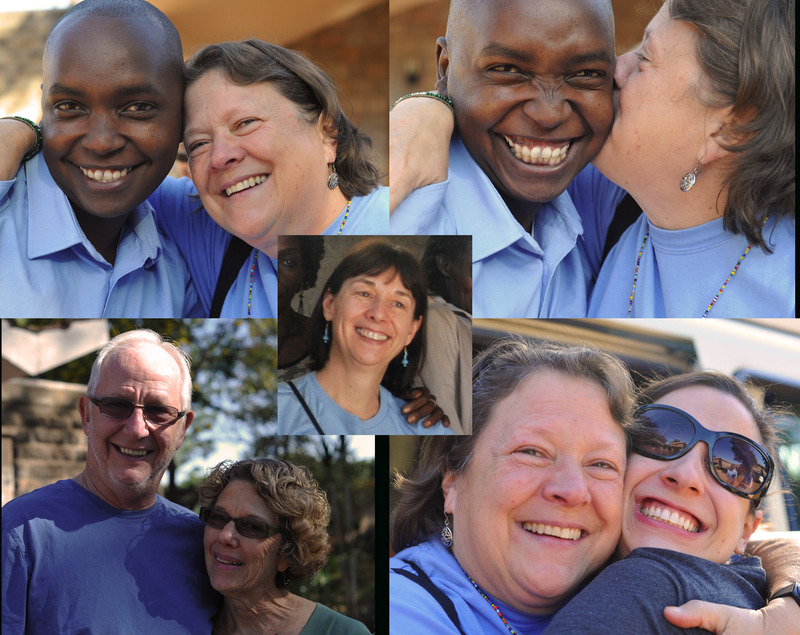 There will be seven of us traveling to Kenya this year, 5 of us make up the Tuko Pamoja U.S. Board and have all been to Kenya before and we have 2 additional volunteers who have never been before who are very excited to be joining us. So let me say a little bit about our plans for this trip. First of all I have to say that it is a wonderful whirlwind of an inspirational, industrious, impassioned and ambitious itinerary, like all the past trips, but even more so! WE will spend some time on the weekends at Nyumbani Children’s Home with multiple enrichment activities plan with the children and other volunteer activities. Having started the tradition of face painting with the little ones 2 years ago and realizing that they remembered the experience when I when I went last year means that this is a must for an annual activity–and one that I have so much fun doing with them. In fact the first place that we land is always the Children’s Home where we get the warmest of all possible welcomes. We will not spend much down time before we are up and running however as we arrive on Friday and have our Tuko Pamoja Board meeting with the Kenyan Board on Saturday. This will give us an opportunity to review the year and plan a day long workshop that we will host for the TP women on the following Saturday. More details will follow as I blog about it, but it is very exciting to have some plans to work with the Kenyan artisans groups in a way that will help them build business and financial skills, take pride in the wonderful work they are doing, collaborate in helping to grow their self esteem and empower them to feel truly successful. 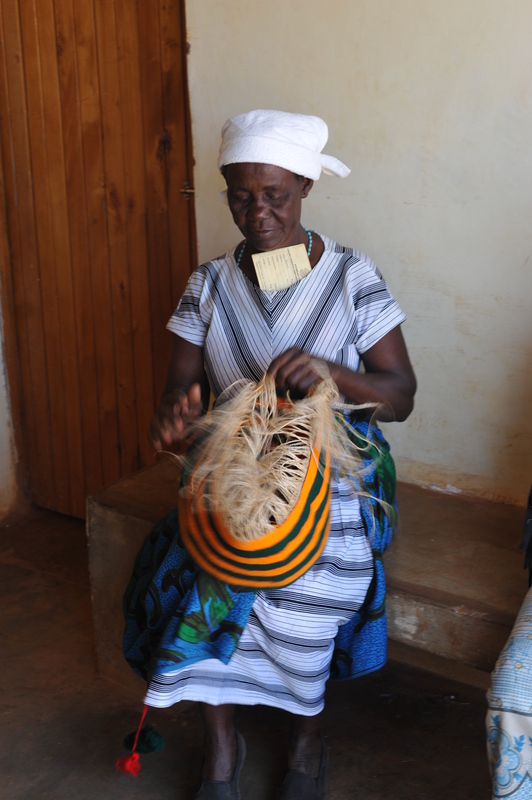 Prior to this workshop and during the week we will be visiting all of the women artisan groups except for the Shushus of Nyumbani Village who we will see the following week when we spend the whole week in the Village. We will go to the outreach clinics in the severely impoverished areas around Nairobi such as Kangemi, Dandora and Kibera. 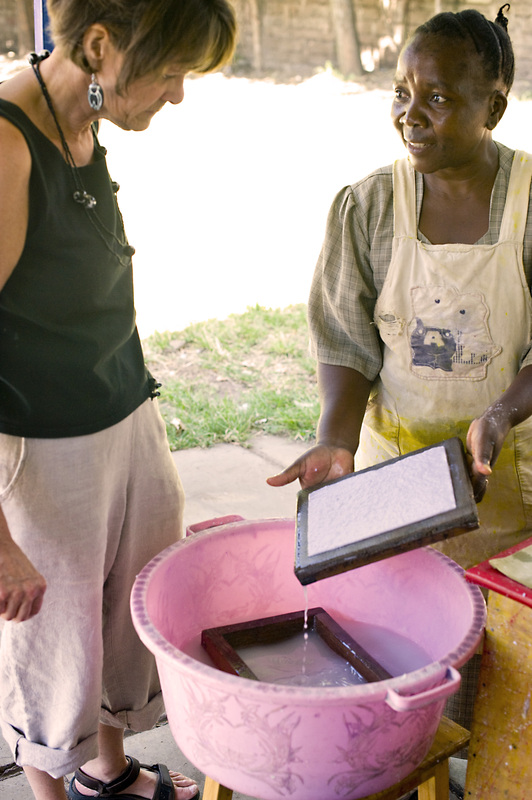 I”m delighted to say that there will be another art exchange with the women of Kibera paper who I had such a wonderful time teaching to block print last year. Yikes, I don’t have the project planned yet but I know I will come up with something that will be fun and valuable to exchange. 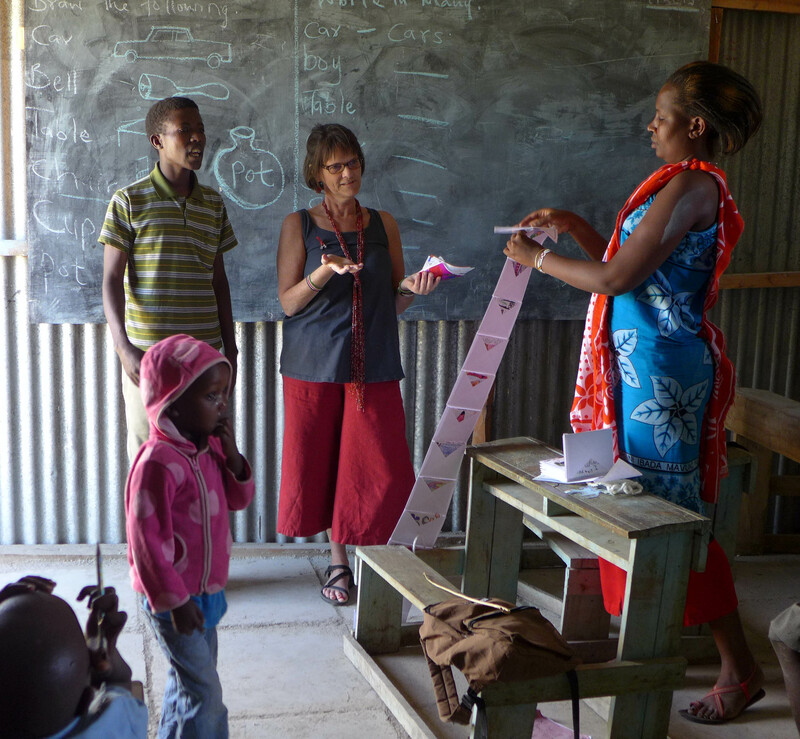 We will also spend 2 days at the Maasai community of PCDA working with those women and their adorable children. One of the plans I have for the children there is to use my new digital Polaroid camera which takes tiny sticky back pictures (2×3 inches) and mount them on some kind of backing so they will look framed and they can bring them home like “school pictures”. They never have pictures of themselves so I think this would be so special for them. Lloydie, since you know I have too many ideas for this trip all the time, you might not know about this plan yet….but doesn’t it sound like fun and something they would so enjoy bring ing home to their mothers?! On all our visits to the women artisan groups we will be reviewing their progress, offering support, going over the sales success of their products etc. During our visits we will be bringing various donations and supplies to different places–like for example last year we brought supplies that enabled the school lunch program (i.e. daily porridge) to continue at the Maasai school where for some it was the major food intake for the day. The work with Tuko Pamoja will culminate with the workshop and then we will head out to Nyumbani Village for the following week. While in Nyumbani Village there is always a lot to be done. Each year we get a list of donation requests along with bringing many duffels of donated clothing and other items with us. Once we get there we sort them and often the Village is the place with he greatest need for clothing and other things. This year amongst the list of requested items was supplies to make 100 chicken coops, one for each family (one grandparent and 10 orphans) in the Village. Clearly we need to go out and purchase the supplies and part of our role will be to help to build the chicken coops! Now I am usually busy much of each day working in the clinic with Lilian doing psychiatric consultations but I have been encouraged to join in the fun of chicken coop building at least long enough for a good photo op. I have never built a chicken coop, but I’m very handy with tools, so this is not too daunting to me and if the who Shushus are participating it could be a wildly fun time. I will also be helping the children do art work for the Memory Book which is being created with the stories of all the grandparents of the Village. Lilian, who I recently corresponded with over email tells me she already has a client waiting list for me so I don’t think I will not have a problem with idle time! 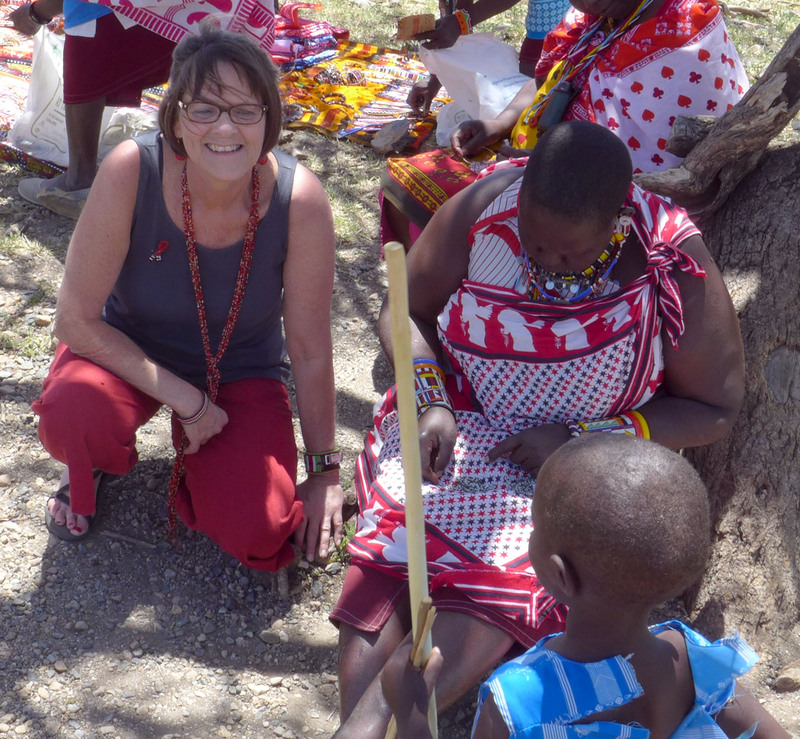 Then again, there is no idle time when we are in Kenya, just time full of amazement, magical time immersed in the culture, singing, dancing, and feeling connected to people who live across the globe and then stay forever in your heart. I will wrap up my stay after we return from the Village, but most of the group will stay on for another week and do some additional volunteer at another orphanage. Someday, I will stay longer too when it fits together better with the rest of my life. For now I feel really lucky to have discovered this kind of work, the wonderful people with whom I travel and the remarkable people of Kenya, many of whom have so little yet with which to get by, yet rejoice in life with amazing and admirable spirit that I wish everyone could experience. 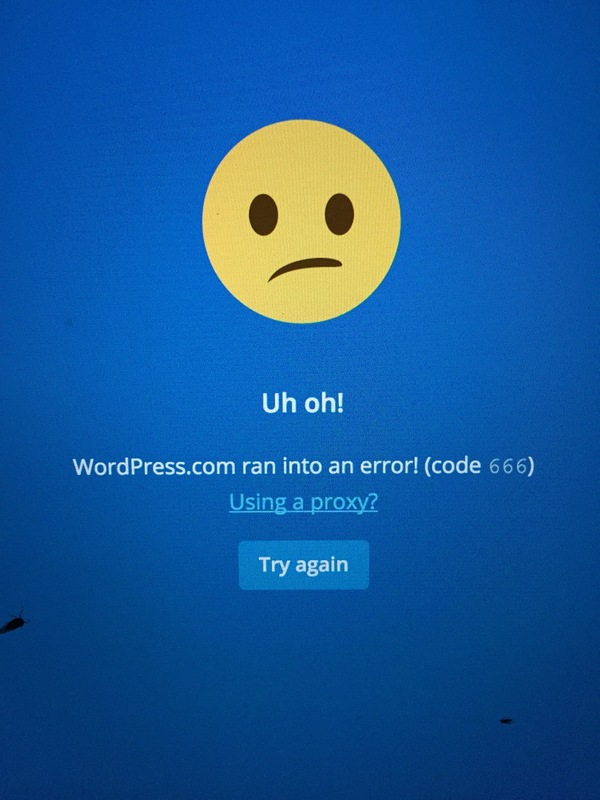 Keep reading my blog….I’ll do my best to share that as far as words will allow. 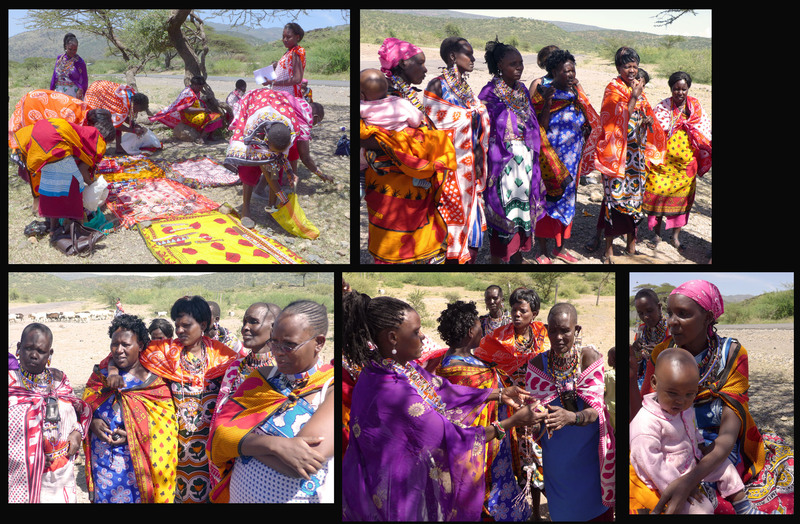 The Tuko Pamoja Team have been singing our hearts out and sending greetings and news of our sales successes to the Kenyan Board and Tuko Pamoja artisans in Kenya. 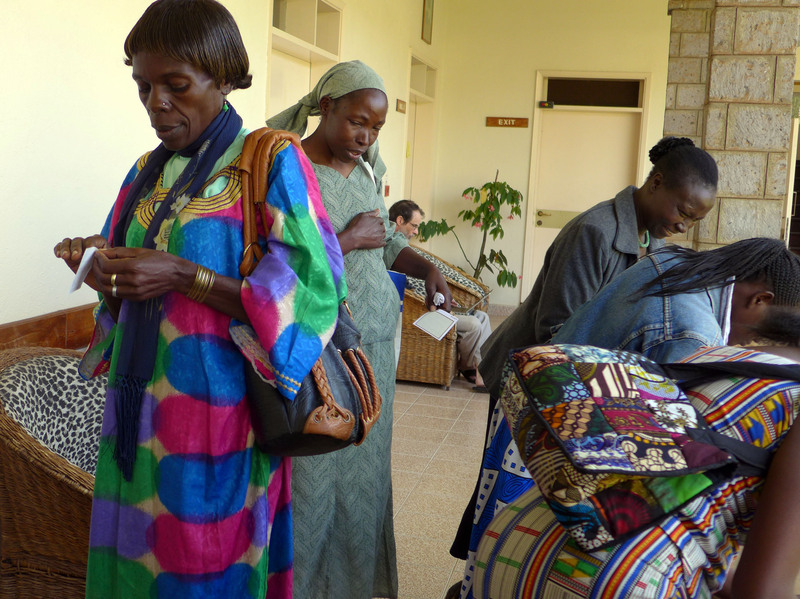 I think that we have lit cyberspace with our excitement as we have shared how people here have generously opened their hears and their wallets, wrote encouraging and inspiring comments in our guest book and truly enjoyed the Kenyan women’s crafts. We have all felt the sense that this was better than expected and OMG, this is really going to work. “We might be on to something pretty TERRIFIC!” “This just makes my heart sing!” “And I’m singing the same tune right along with you!!! 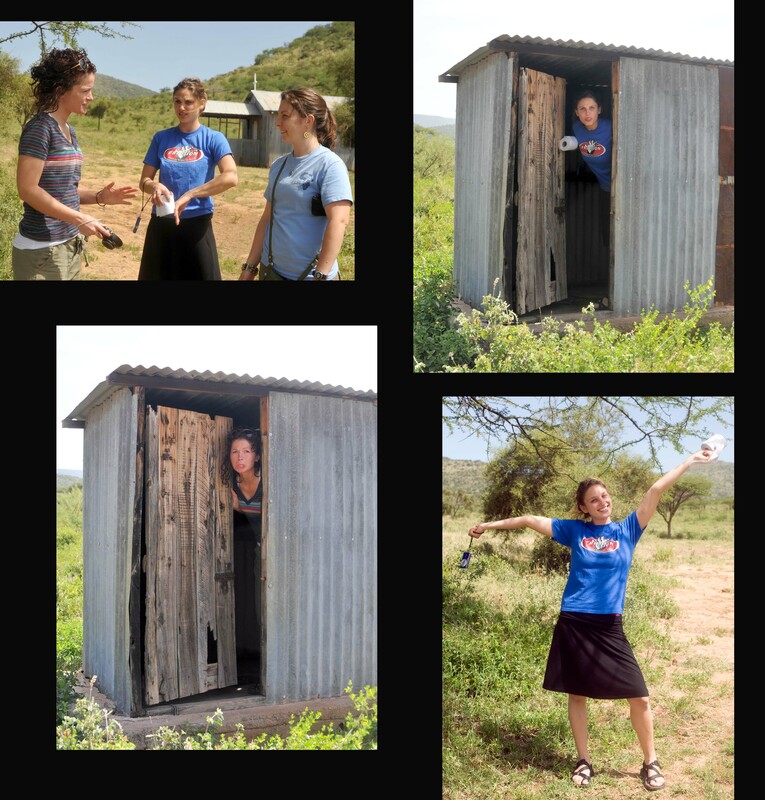 !” Well, you get the point—a lot of excitement, and joy, and truly a countdown to Kenya as we cant wait to share all this in person with the women of Tuko Pamoja. Sadly, however, in the midst of this, we received word from Cecily that one of the Tuko Pamoja artisans, Hilder of Kibera paper had died suddenly after a brief illness. She traveled upcountry in Kenya to see family, returned feeling ill, was treated for malaria and died within a few days. She was the single mother of 3 children. Our hearts were deeply saddened to hear of this news, to think of her, her family and children and all of the women grieving at Kibera paper. 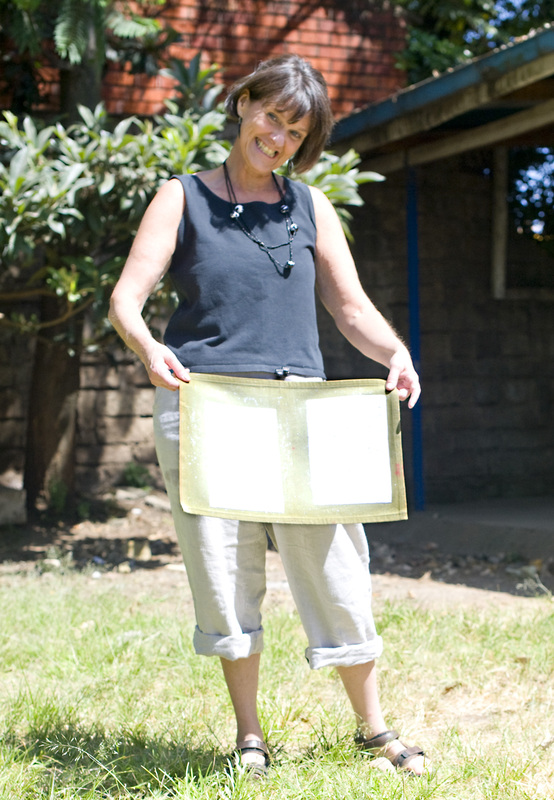 If you saw the blog while we were at Kibera paper, you will recall Hilder as the very patient, welcoming lovely woman who taught everyone of us how to make paper. And watched as we tried, often more than once…. Despite the language barrier she had some humor along with us about the moments of our less than stellar performance and a very warm presence. 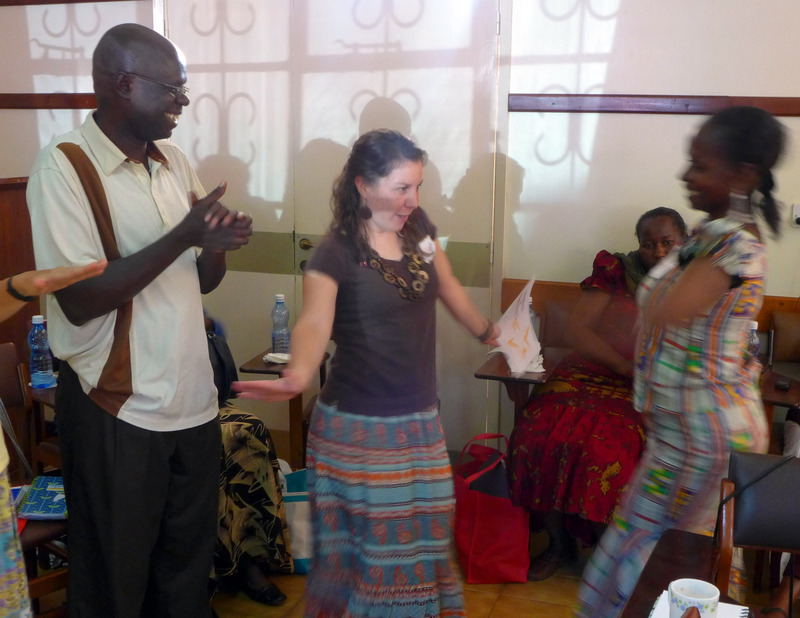 And like all of the women at Kibera she drank tea and sang and danced with us (she is the first woman that Lloydie enjoins to dance). 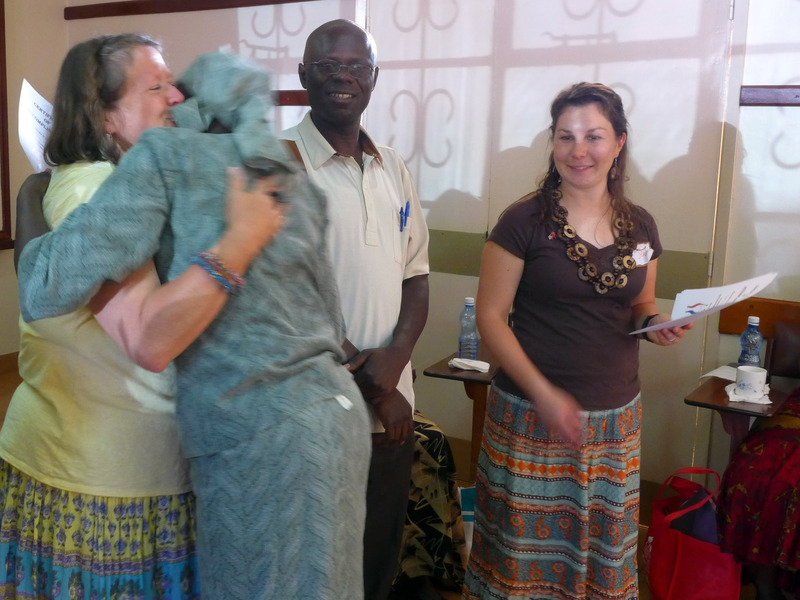 We enjoyed her very much and will miss her at Kibera Paper when we return in January. 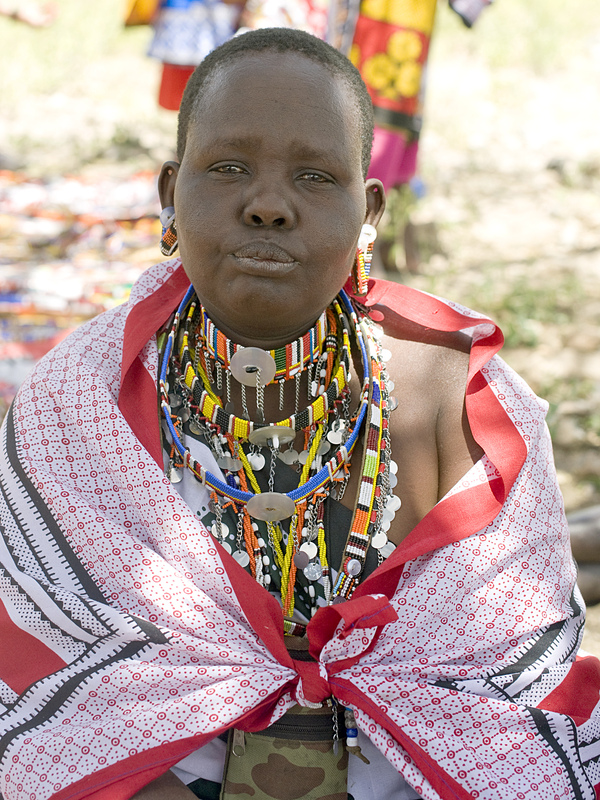 Hilder is the 2nd of the Tuko Pamoja artisans who has passed away since we left Kenya. 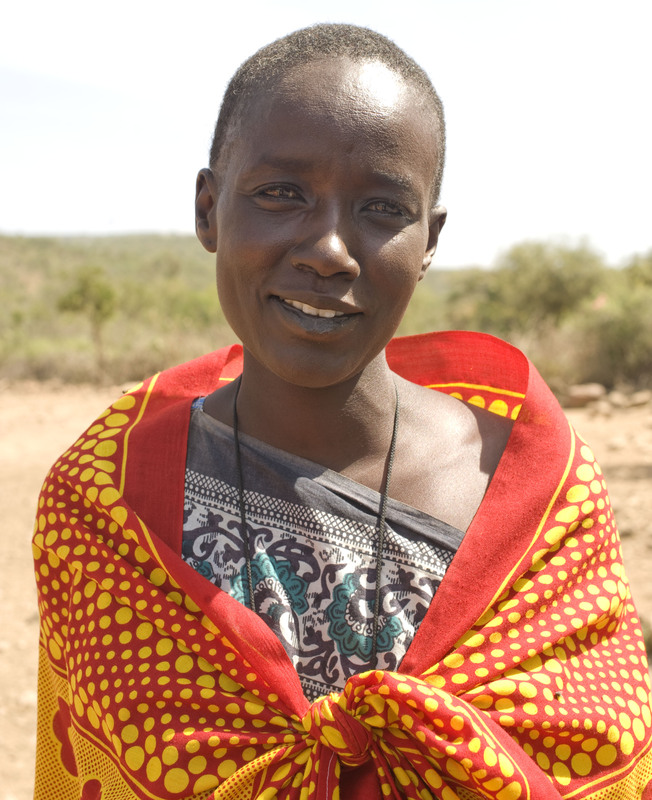 You may recall that Jane of Maasai Village of PCDA died unexpectedly of illness as well. While I pay great homage to these woman for their strength of spirit, their resiliency and determination to care for their children under very difficult circumstances. I am reminded that their hard lives, lives in extreme poverty, with little access to good nutrition , health care, and many of the things that we take for granted—it all takes it toll. These women died young by our standards. 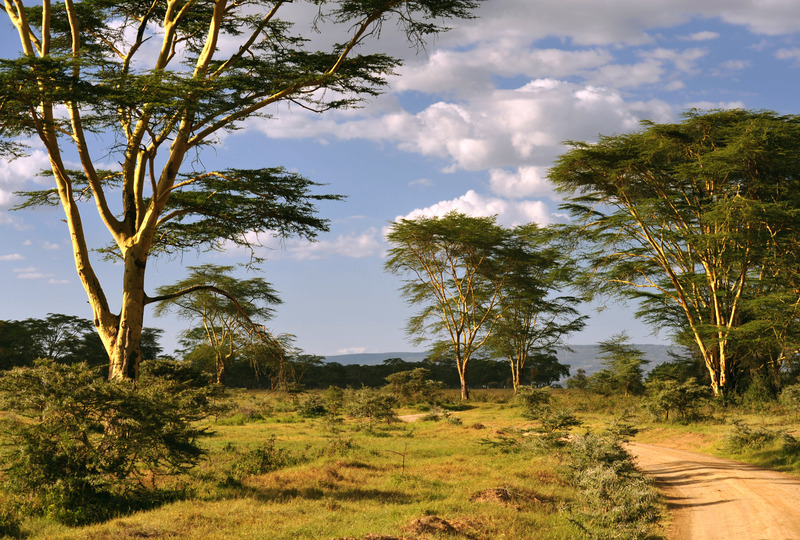 I tried to find out what the average life span in Kenya is, but found conflicting figures. 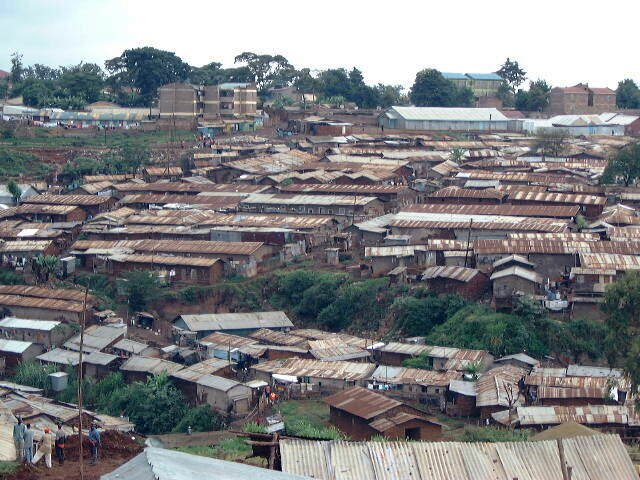 Its safe to say that it is at least 20 years younger than here in the U.S. and in the extremely compromised communities like Kibera it maybe as low as 30 years old. So we send our truly heart felt condolences along to Hilder’s family and her friends and fellow artisans at Kibera paper and we carry on the work of Tuko Pamoja–the partnership with these and the other artisan groups in the hope of making some difference in their lives, helping them have an income they can count on, bringing them some hope for the future and with the hope that the long term toll of the hardship of their lives will somehow be a little lessened by our efforts and those who join with us. I headed down to Maryland this weekend, outside of Washington DC, early on Friday morning to get ready for the kick off event for the Tuko Pamoja initiative. 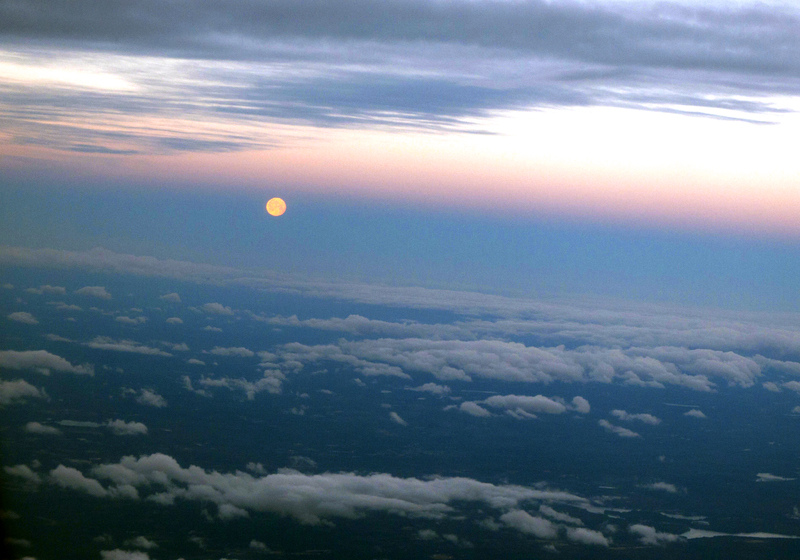 It began as a serene and very short flight by comparison to flying to Kenya although memories of Kenya were very much on my mind as I traveled. 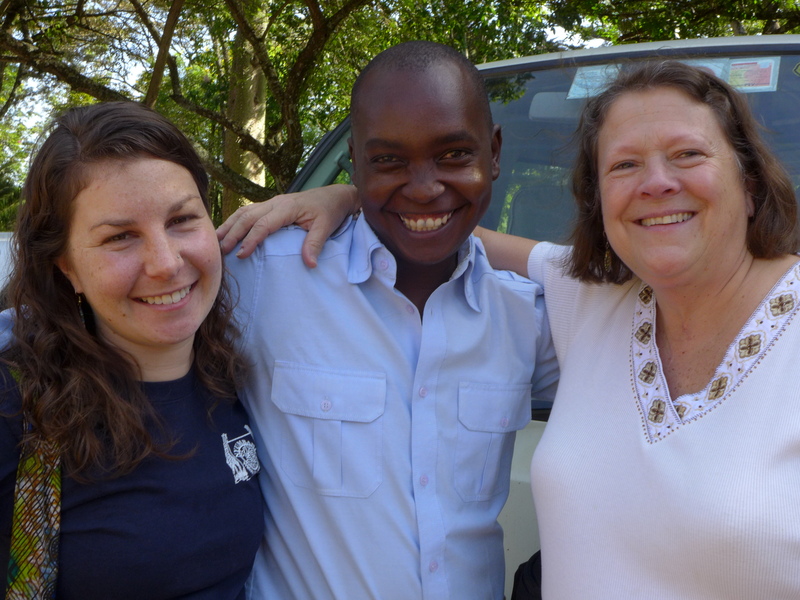 I was thrilled to be able to meet up with my fellow Kenya volunteers, Lloydie and Deb and to see Jen, Lloydie’s assistant whom I got to know better over the course of the weekend. On Friday we spent the day finishing the preparations for Saturday’s event and spent all day talking about future plans for the initiative and travels to Kenya for next January. We have so many ideas when we get together that the synergy and excitement are a little mind-boggling! 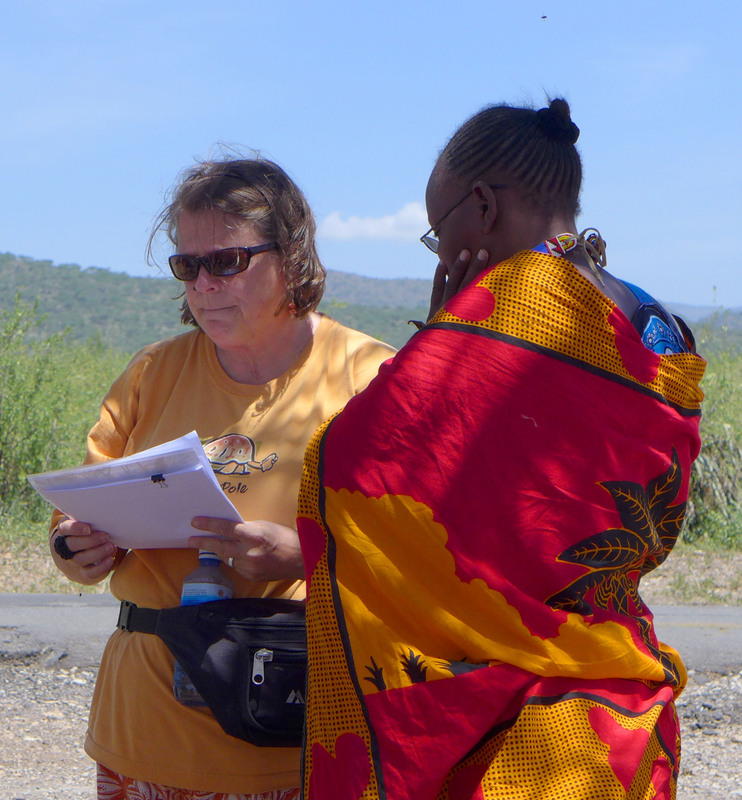 We are pursuing a non-profit status for Tuko Pamoja and came up with oh-so-many ideas for making this a successful project for helping the women, our friends of Lea Toto, Nyumbani Village, Kibera Paper and the Pastoral Community Development Alliance in Kenya. It goes without saying that the group of us have incredible passion about this mission and amazing bonds with each other so spending time together just by itself is a great experience. Jen and Lloydie had been working hard on the set up well before I arrived and much of it was completed. I added videos and worked with LLoydie’s husband Bill to get my photos on the big screen TV for display. 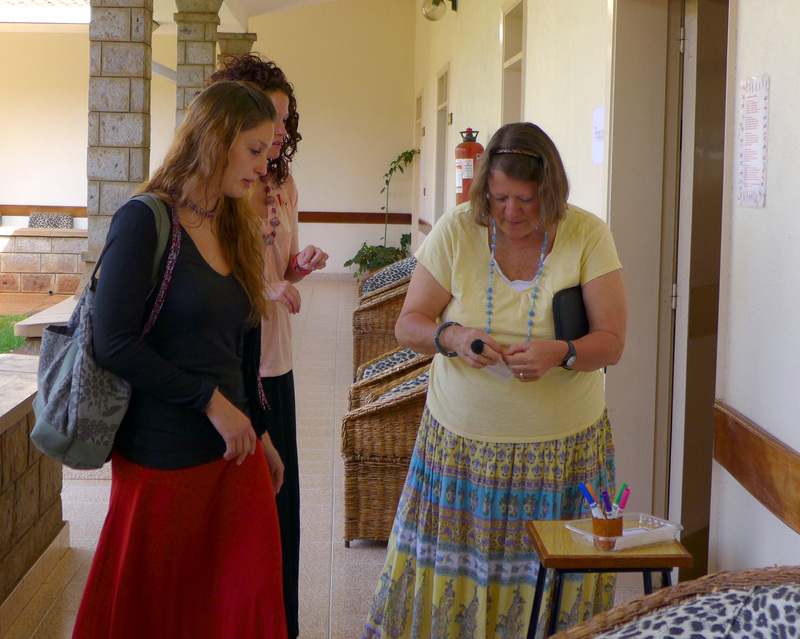 The house was a virtual museum of all things Kenyan and on the first floor was an educational display about each of the women’s groups whose crafts we plan to promote. Lloydie greeted people at the front door to introduce the project, but I think they got a sense of the enthusiasm before they even walked in! Karibu! 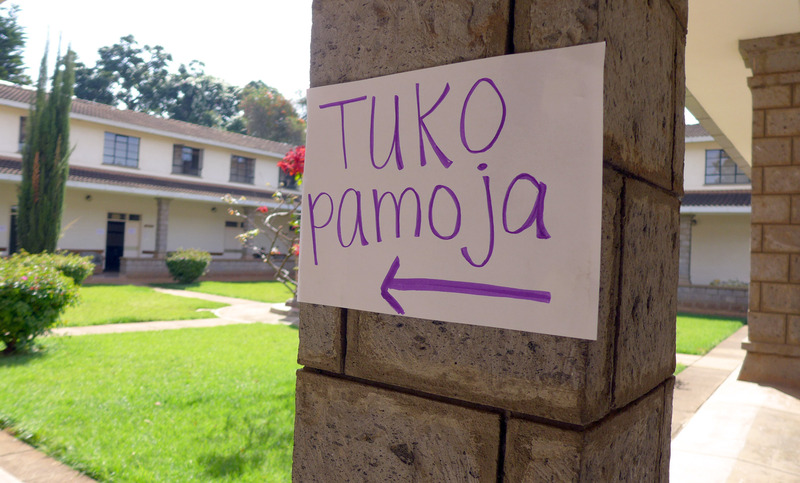 Welcome to the Tuko Pamoja Kick-off--no mistake, you are at the right house! 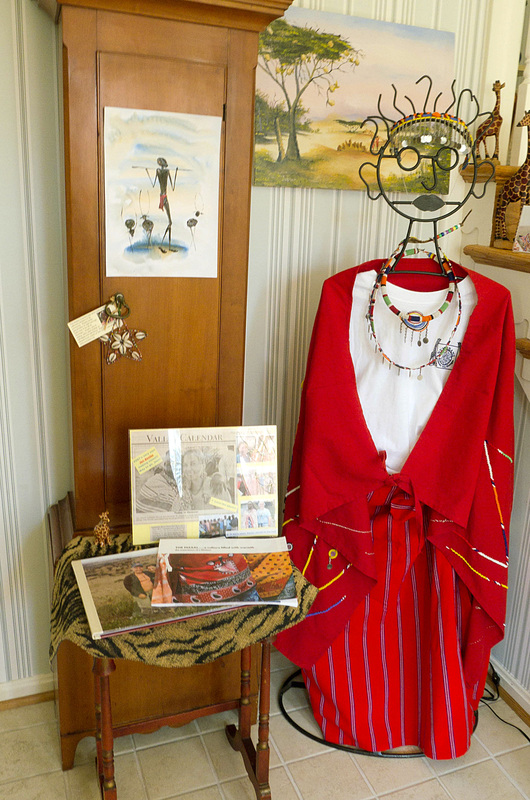 Maasai display in the entry way---affectionately known as "Maasai Mary"
Our goal was to not only gather feedback about each of the crafts we had chosen as samples, but also to have our guests “meet” the women by sharing our personal experiences with them. 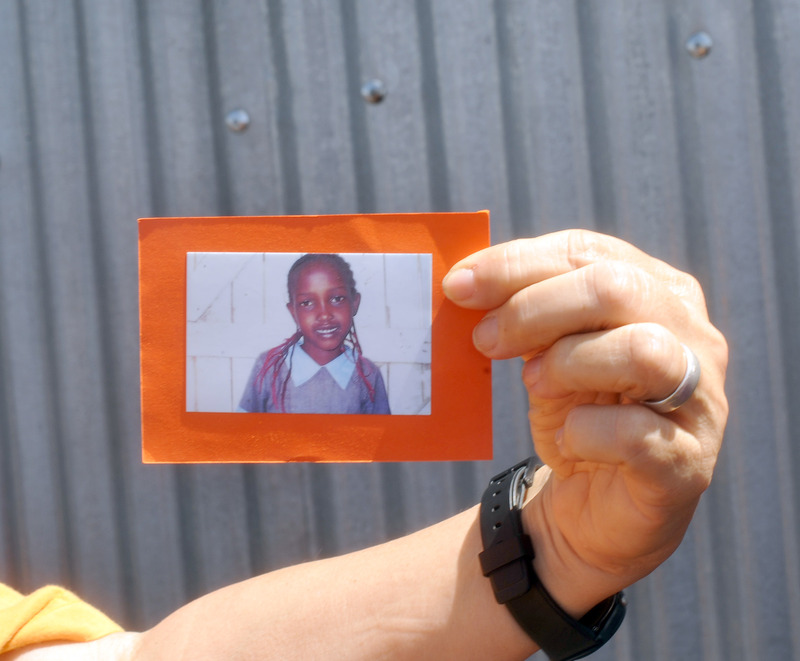 I was at the Kibera paper station where there were photos of the days we had spent there learning to make the cards with them and doing the art exchange process of teaching them to block print and make valentines. I also had a video clip of us singing and dancing together so that people could see the sharing of the experience and the joy that it brought. 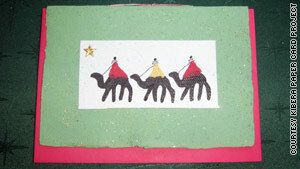 There was information about Kibera and Kibera Paper and there were samples of the cards. I had a great time telling people about the women, our time together and how meaningful the experience was as well as about the cards and how they are made. 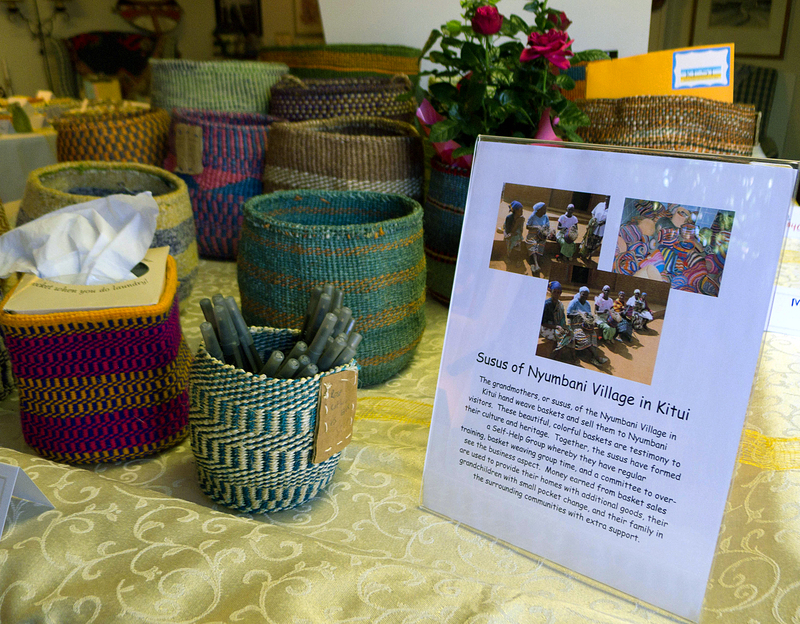 Deb was at the display about the Susus of Nyumbani Village and their baskets and Jen introduce the women of Lea Toto projects. In the basement, many tables were set up with examples of crafts from each group with surveys to fill out. 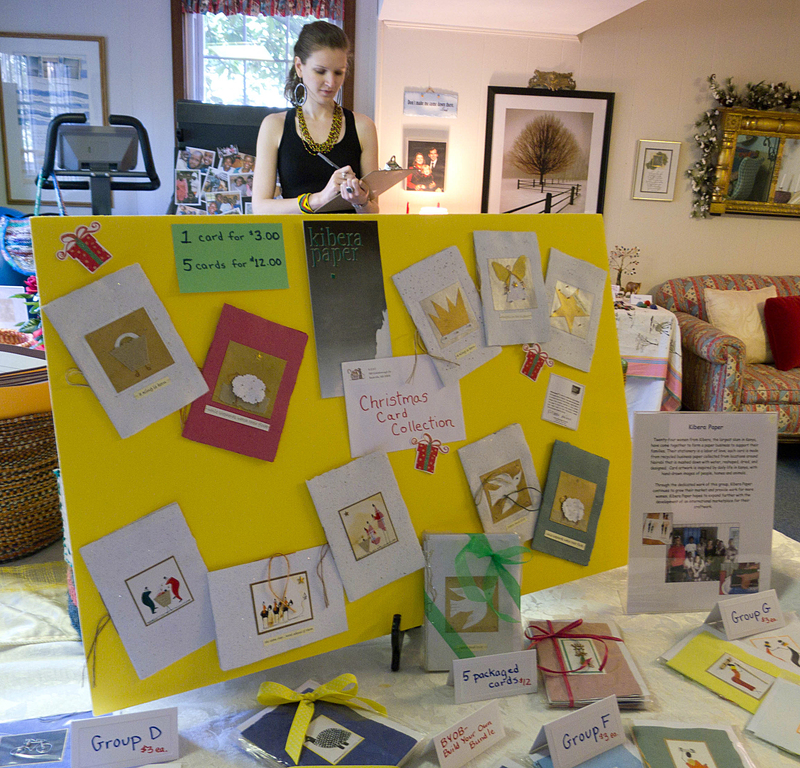 We had almost sixty people who came and also filled out surveys to provide us with invaluable information about the crafts and which ones they think will be most likely to sell. THANK YOU TO ALL WHO PROVIDED FEEDBACK ON THE SURVEYS!! 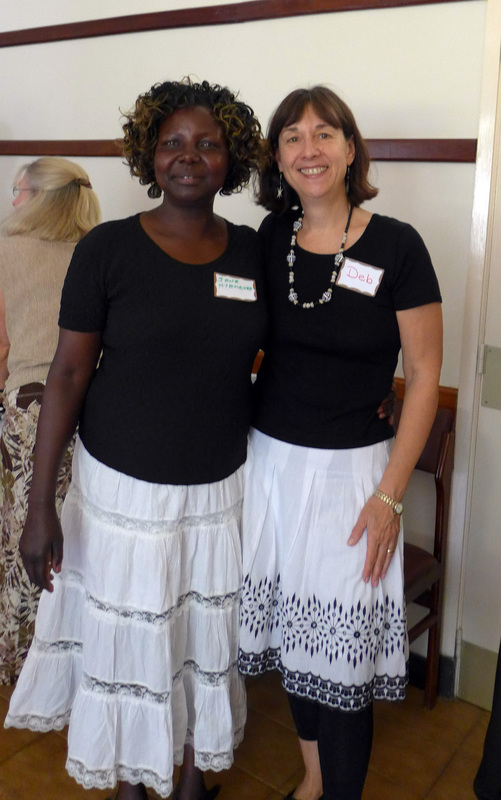 We really enjoyed sharing stories of the amazing Kenyan women with everyone and were thrilled to get such positive and enthusiastic feedback. 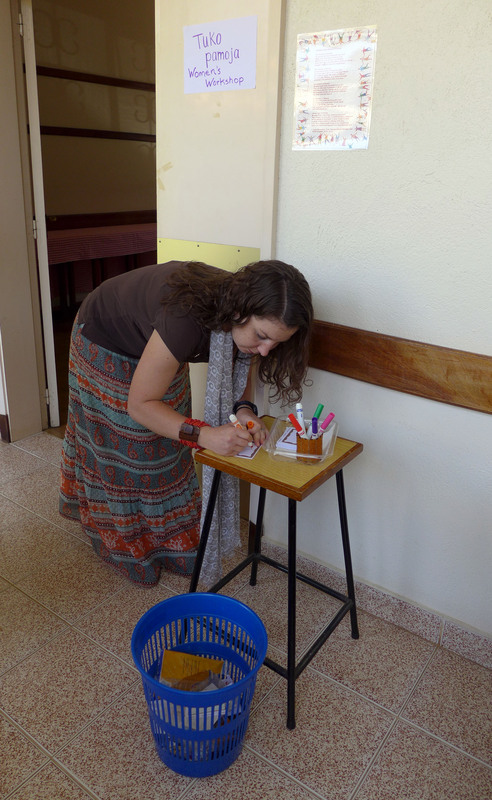 Next we will review surveys and make some decisions about which crafts to order when Lloydie returns to Kenya in June. She will place the order then and get the crafts in August to bring them back to the US (details for transporting hundreds of baskets, hundreds of cards, etc yet to be worked out). The women will be paid the fair market value in Kenya then. 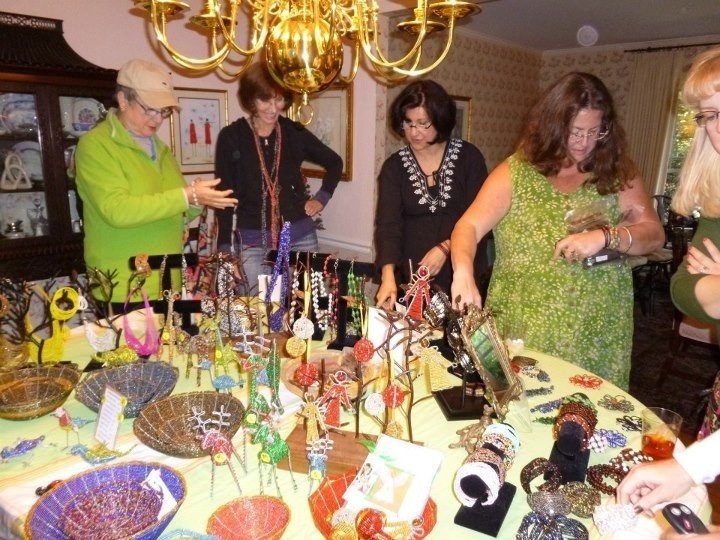 Once the crafts are brought back to the US, they will be boxed for home party or craft fair/event sales and after they are sold here the women in Kenya will get an additional payment. If this works successfully the hope is to have this grow and to add a website and more…. We also provided some pretty delicious snacks for everyone and a chance to buy some Kenyan items on our sales table bringing in $1000! It was a very exciting and inspirational day that ended with a sense of accomplishment and more vision for this project. 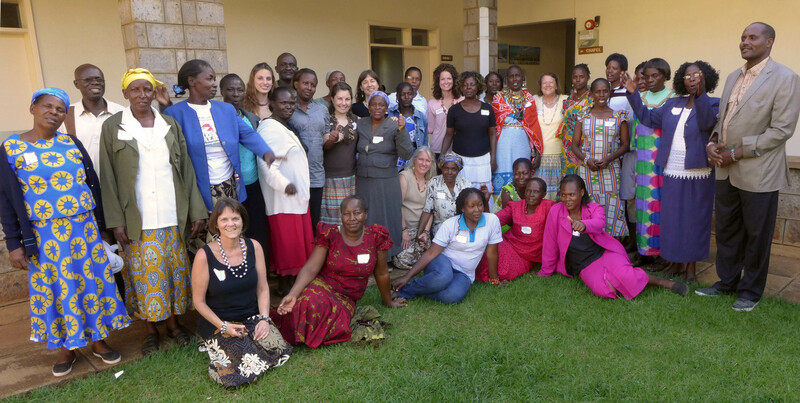 We felt more than ever that our mission to help these women in Kenya and to thereby help their children can actually be realized, that we will no longer leave struggling with the sense of not knowing how to really help them, and that it will be possible to truly do something that could make a difference. 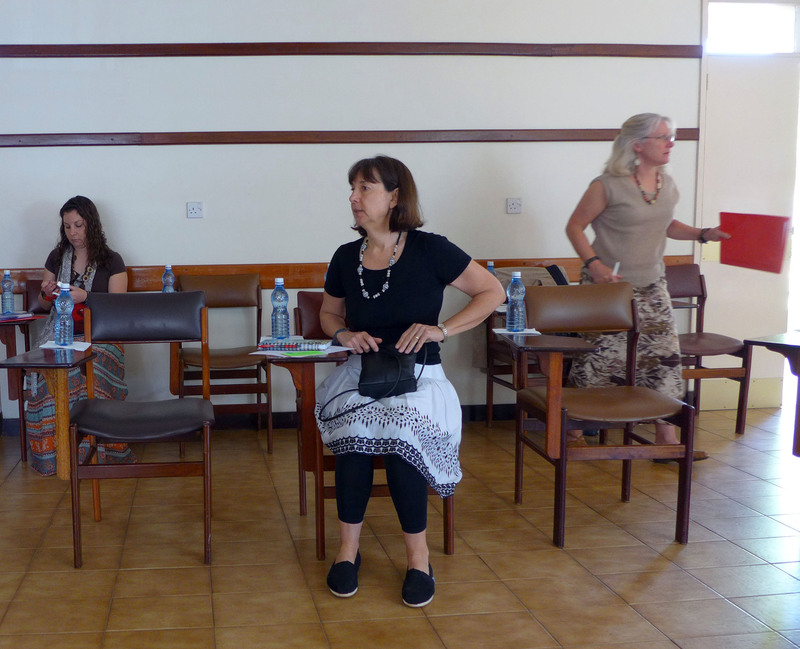 We were all tired at the end of the day….but I think we all had a little trouble sleeping from the excitement of Tuko Pamoja– of all being in it together. We have a lot of work ahead of us, but it’s work we can’t wait to do….. I wish we could have shared this day with the women in Kenya, that they could have been there too, but in many ways, it felt as if they were. 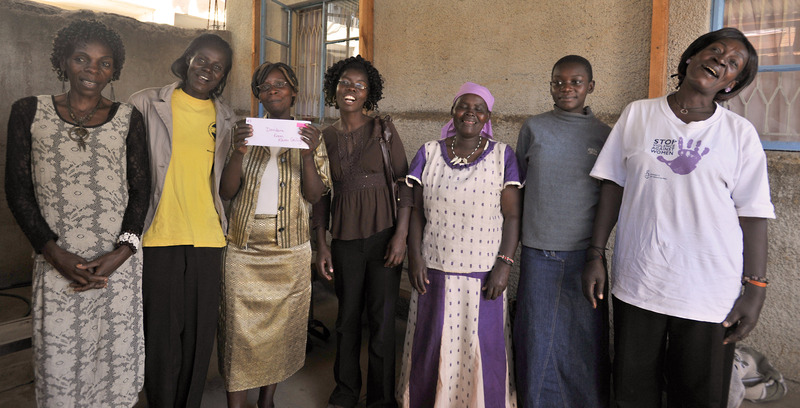 Originally it grew out of the idea of wanting to help the mothers of children with HIV who are getting services from the Nyumbani Lea Toto Clinics in the slums……because whenever you help the mothers in a community you help the children, whenever you help the mothers, you are helping everyone. 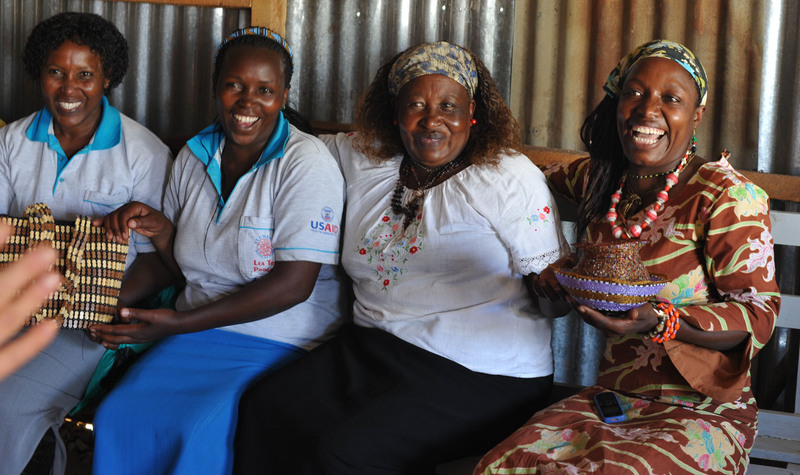 There were already established groups of women, like the Vision Self Help Group of Dandora, working together to craft products to help finanacially support their families and to emotionally support each other. They had been selling their crafts, but the market was quite limited. And then the idea grew to helping other women’s groups who have been severely affected by hardship and poverty and also hand creating incredible crafts. 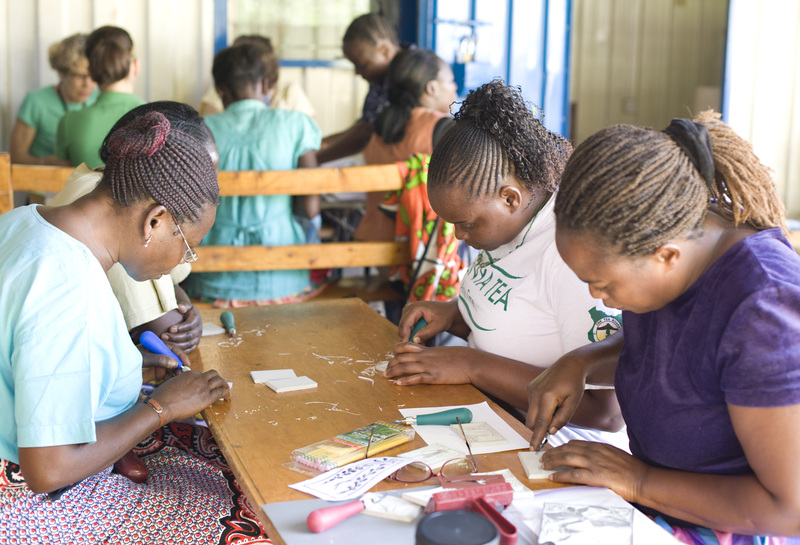 Groups like the grandmothers of Nyumbani Village who are raising so many orphans after losing their own children to AIDS and weave beautiful baskets of sissel and yarn; the women of Kibera Paper who hand make greeting cards, each individual works of art from recycled paper; and the Maasai women of PCDA who doing amazing beadwork. First it was casually called the Women4Women project as it was beginning to take form. Now it has gathered momentum and garnered lots of enthuisiasm as it has gone from the U.S. to Kenya and come back again and has evolved a new, very appropriate name of “Tuko Pamoja” literally in Swahili, “We are together”, the spirit of which is that we are working together. I am hoping that my family and friends will be interested in supporting this program, and not just by purchasing crafts! 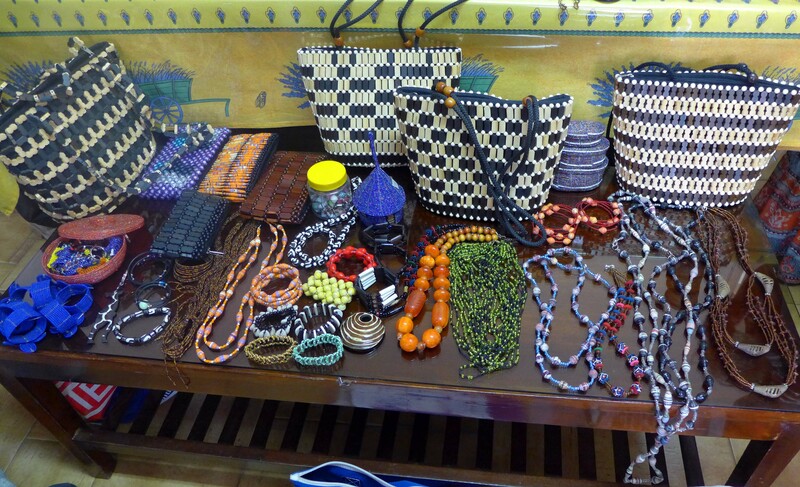 Women from all across the country will have the opportunity to sell these products on behalf of our Kenyan sisters! This can be done by hosting a party in your home, much like a Tupperware party, or by having a table at a local fair or bazaar. 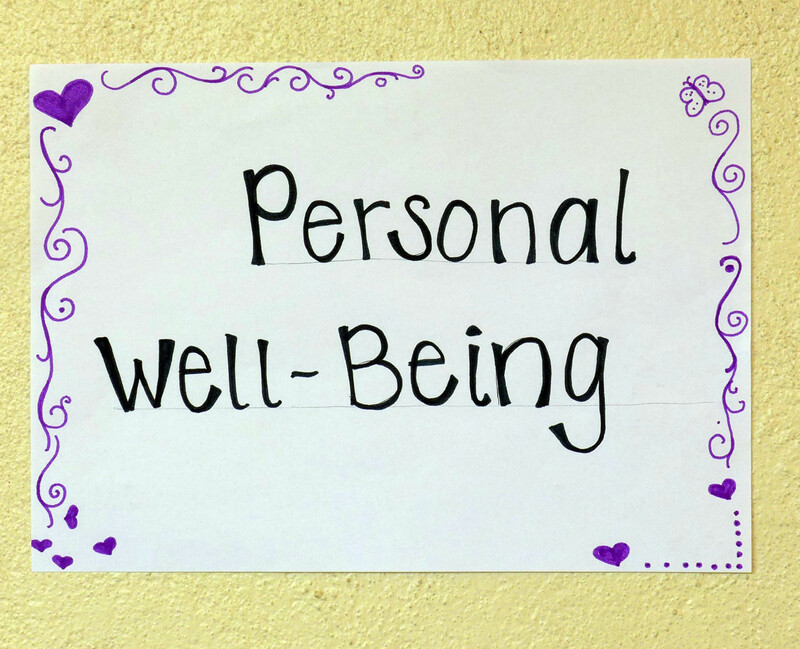 KEST will provide everything but the customers, your friends! 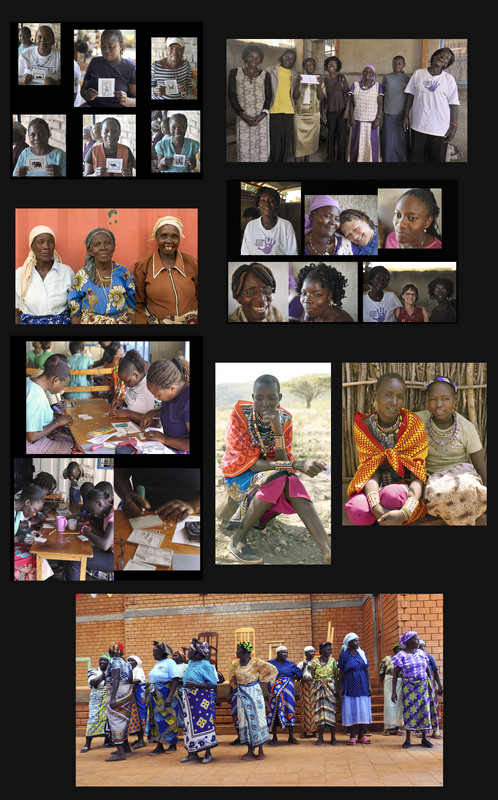 The womens groups in Kenya groups in Kenya who will be initially supported by the project are the groups whom I previously mentioned. 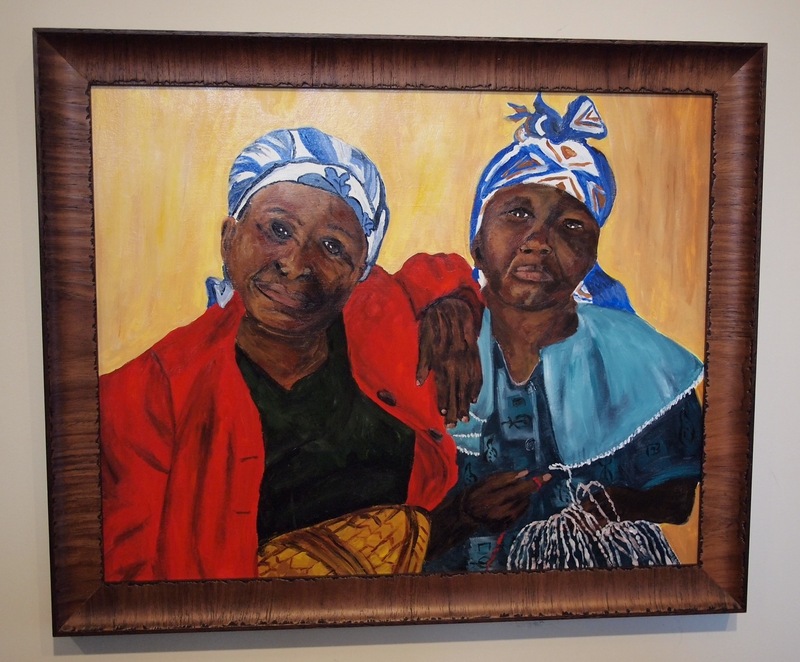 The Pastoral Community Development Alliance woman’s crafts group. 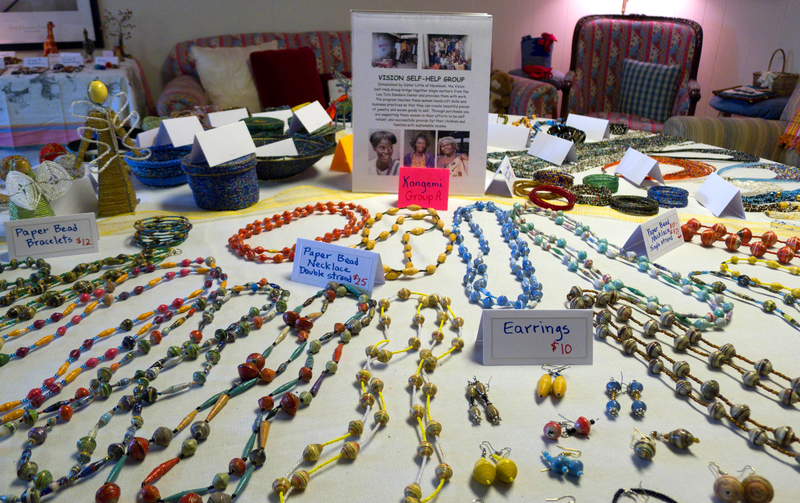 You can get a glimpse of thier capacity to do beadwork just by lookint their own necklaces and bracelets! The Susus or grandmothers from Nyumbani Village who have all lost their own children to AIDs are are all each raising 10 AIDs orphans. 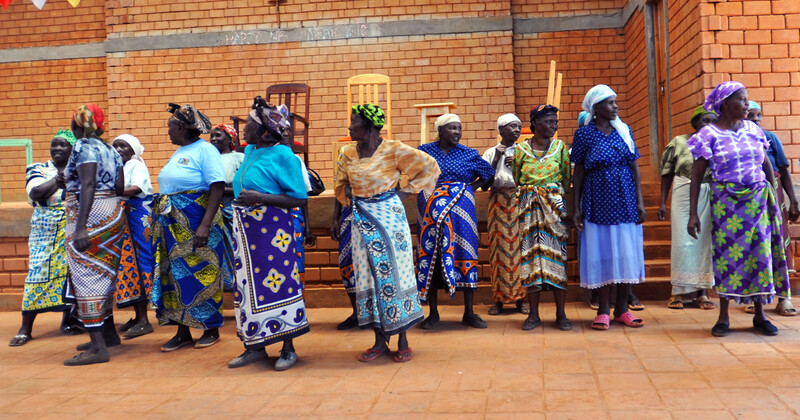 Not only can these spirited and rocking grannies dance, but they are the keepers of the Kamba culture for the Village, the ones who make the homes for the children and are skilled basket waevers with many years of experience! 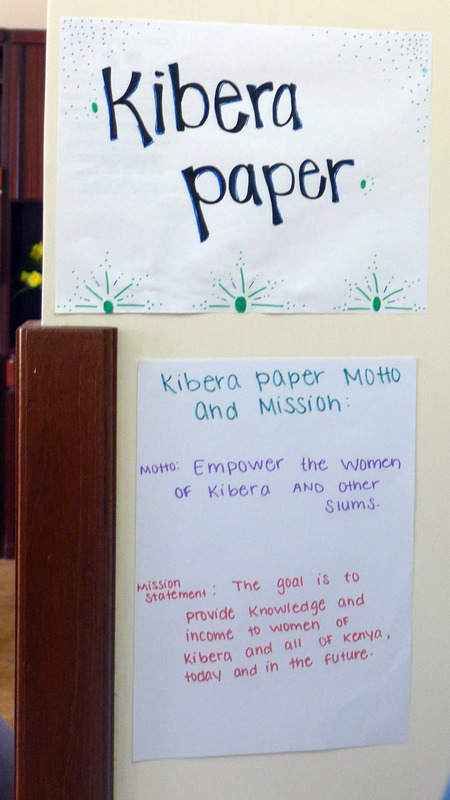 The women of Kibera Paper all live in Kibera, the largest slum on the periphery of Nairobi. 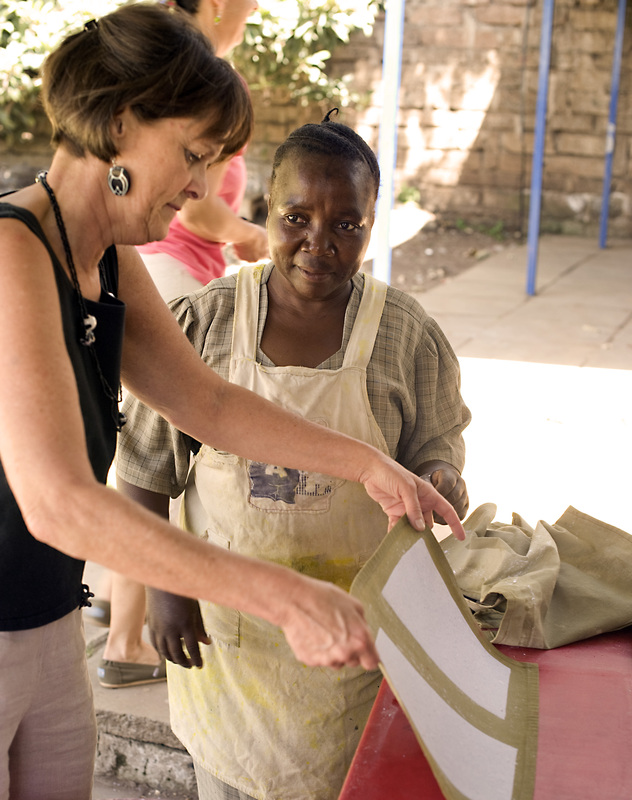 They work at Kibera Paper in order to make an income to support the very basic necessities of life for their families. 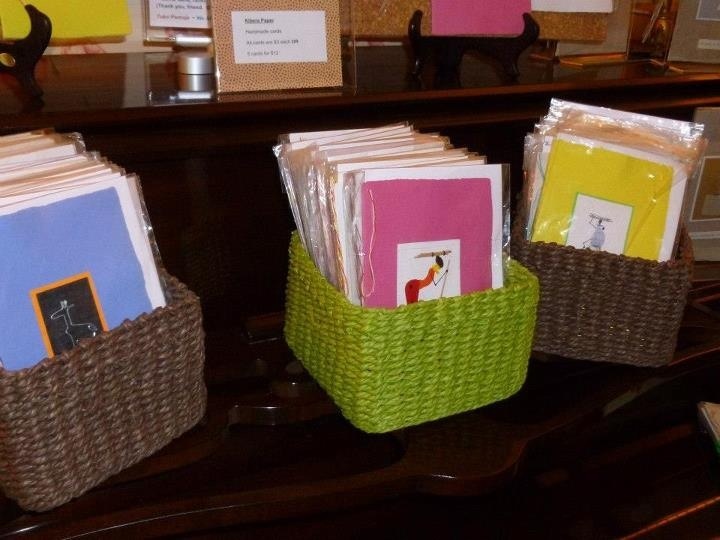 All of their cards are made from recycled paper and in each one is individually crafted, panted, wired, threaded, designed and signed by hand. Having worked side by side with them I can attest to just how much work goes into each card and to the beauty of each card. 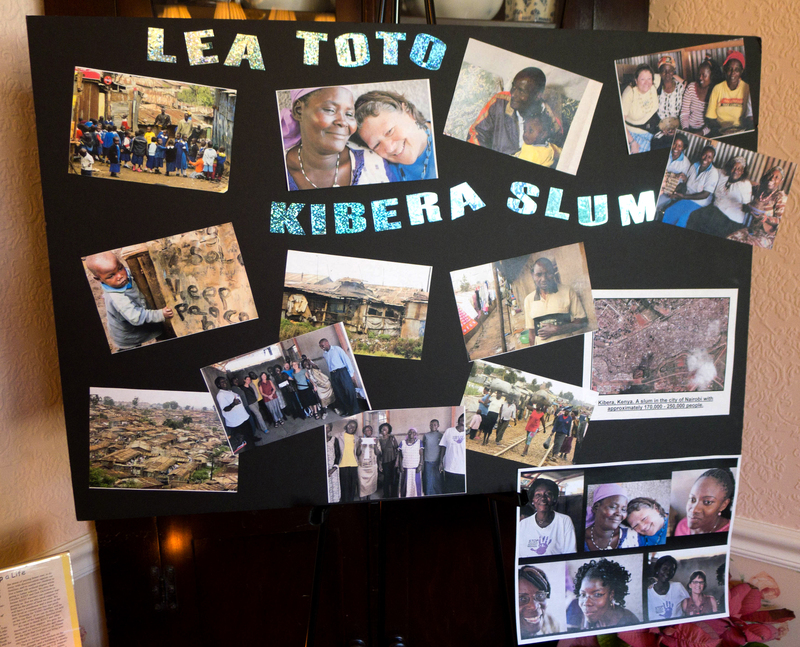 On March 10th, KEST is hosting a kick-off event to the Tuko Pamoja Project at Lloydie’s House near Washington D.C. It will be an opportunity to introduce the project to as many people in the area who can come, to get feedback on the crafts we hope to promote and to give people an opportunity to “meet” these women through the sharing of our experinces with them. Having spent time with all of these Kenyan women, I personally say that I have tremendous respect and admiration for all of them. 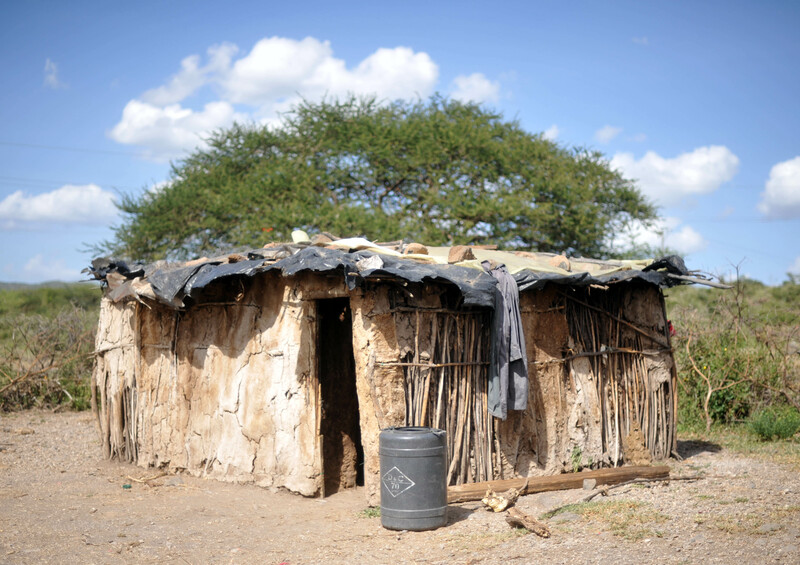 They all struggle with tremendous poverty and many have been through unimaginable hardship and loss. 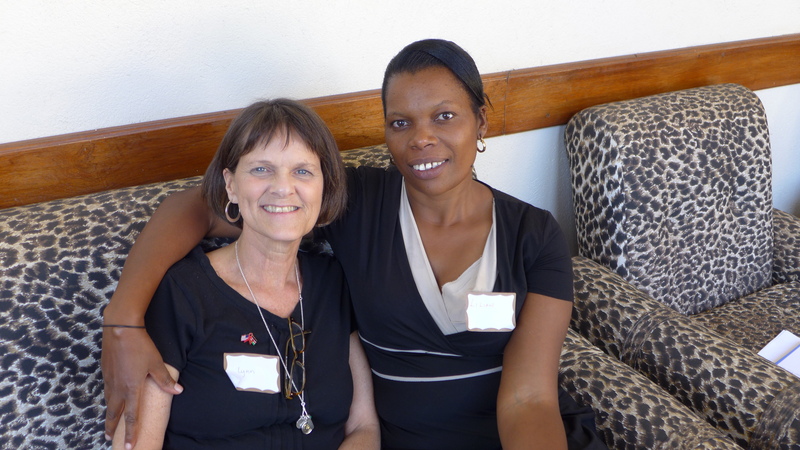 They are however some of the most grateful, resilient, and warm women and mothers I ever have met. I know that I speak for all KEST travelers when I say that spending time with them has created a special place in our hearts for them–we have created with them, sung and danced with them, listened to their stories, drank tea together, hugged and exchanged heartfelt words and shared tears in saying goodbyes. 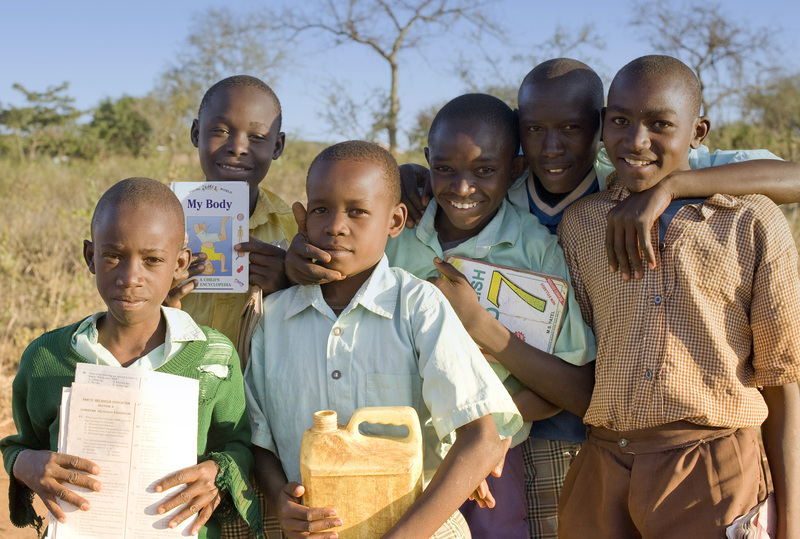 We want to share in helping them in their lives, after all “Tuko Pamoja,” we are truly all in this together! 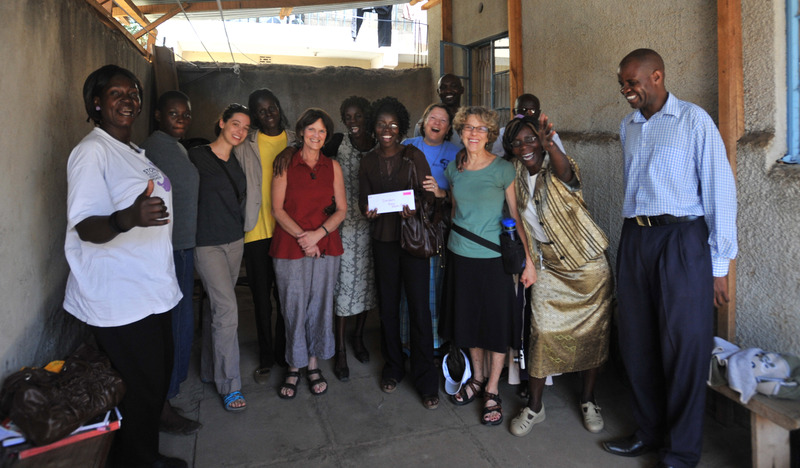 If you missed it before here are the Kibera Paper women singing with us before we had to say goodbye. Now I have the impossible task of trying to put into words the past two days—days in which we have laughed, sang (even in sign language), danced, hugged and been hugged too many times to count, cried for being touched by the stories of tremendous resilience and grace, been humbled by the strength of character and generosity of people and were profusely thanked often by people with whom we felt honored to be able to share some time together. These have been the two days in the slums of Dandora, Kangemi, and Kawangware in the clinics of the Lea Toto programs, the Dandora Program for the Deaf and meeting with the Self Help Groups. In each of the three sites we visited we talked with various different staff members of the programs—the Directors of the Eastern and Western divisions of the Lea Toto programs, a medical officer, a nurse, counselors, social workers and community health workers. This gave an opportunity for those who haven’t come to lea Toto before to get an overview and for others who have to get a chance to be updated. When a parent or guardian brings a child whom is suspected of being HIV+ to the clinic, they first meet with a counselor and testing is done at the same time along with counseling. 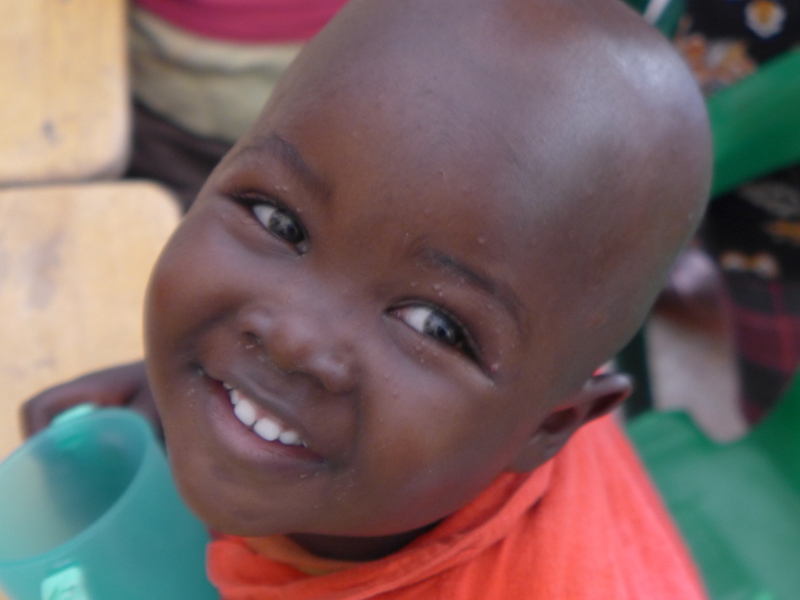 If the results are positive the child receives a medical evaluation, nutritional assessment and begins on ARVs. The entire family receives nutritional support for the first year during which time they are expected to save the resources not spent on food to develop some independence from the food support. The caregivers are provided with extensive counseling and the child is given emotional support, support for school fees if needed, etc. Social workers do home visits on a regular basis and community support worker are volunteers who receive extensive and ongoing training and do home visits as well. 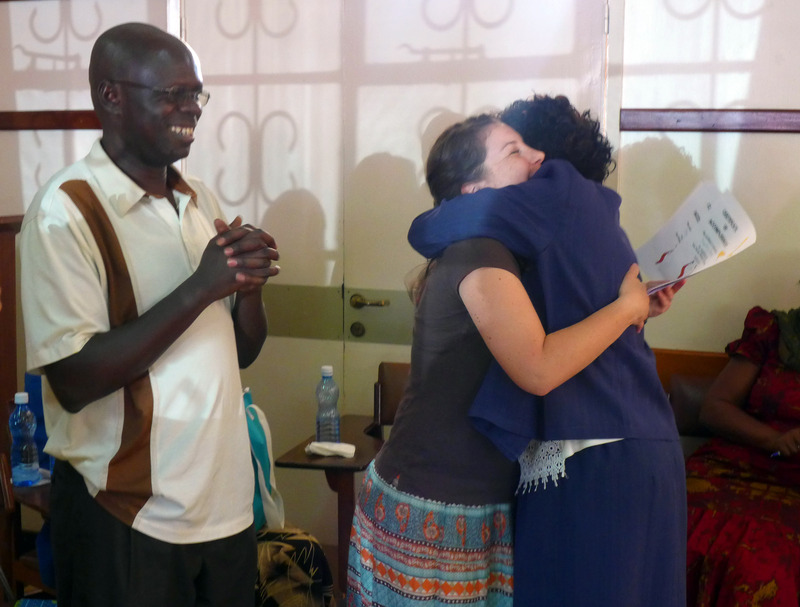 When we met with community support workers, many of them were former or current clients in the Lea Toto Programs who felt that they were grateful for what they had received that they wanted to give back to others. The dedication of this staff, the workload that they carry is phenomenal and hearing them talk about why they do the work and what it means to them was so inspiring that when it came our time to speak we could hardly talk—Kristen and I were first and we were just passing the tissues back and forth. Paul, the Director at Dandora, and the Director of the western division of the Lea Toto Programs, was a very thoughtful and well spoken man, who told us to remember that every little bit of help matters, no matter how small, and that it can be overwhelming to look at the overall larger picture, but when you help the person who is there in front of you, that help is enormous. He also told us that people often have many needs, but what they need most from you is “heart” and the rest follows. 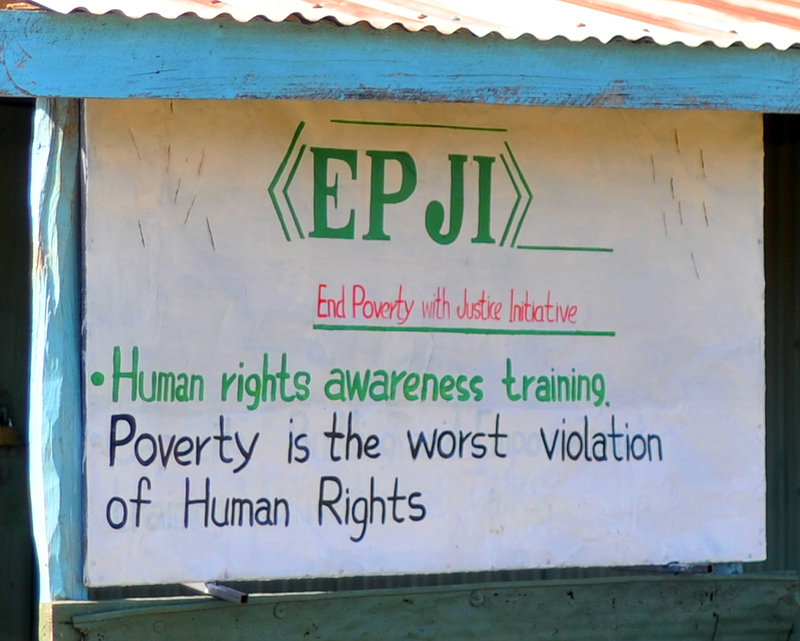 We did do several home visits with the social worker and the community support worker at Kangemi . 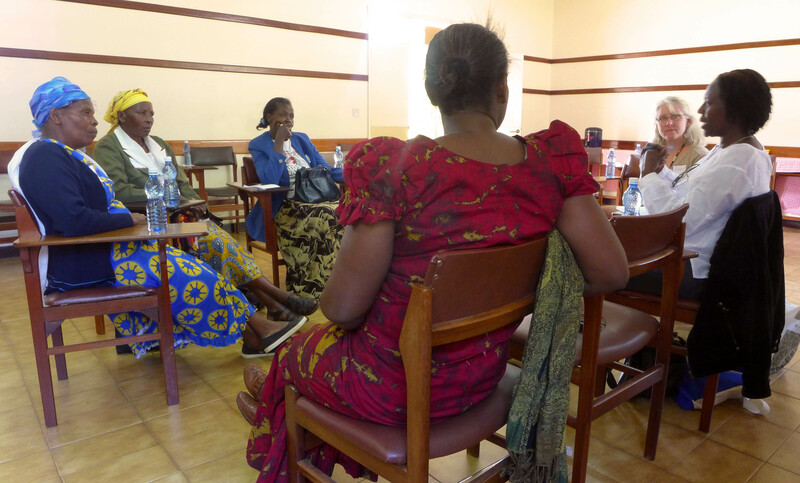 In fact we found that often the several of the women of the self help groups also worked as community support worker. We also met with the Self Help Groups to share time with them continuing to build relationships and to shop from their crafts. This included groups at all three sites including the Vision Self Help Group whom I had previously met in Dandora 2 years ago. 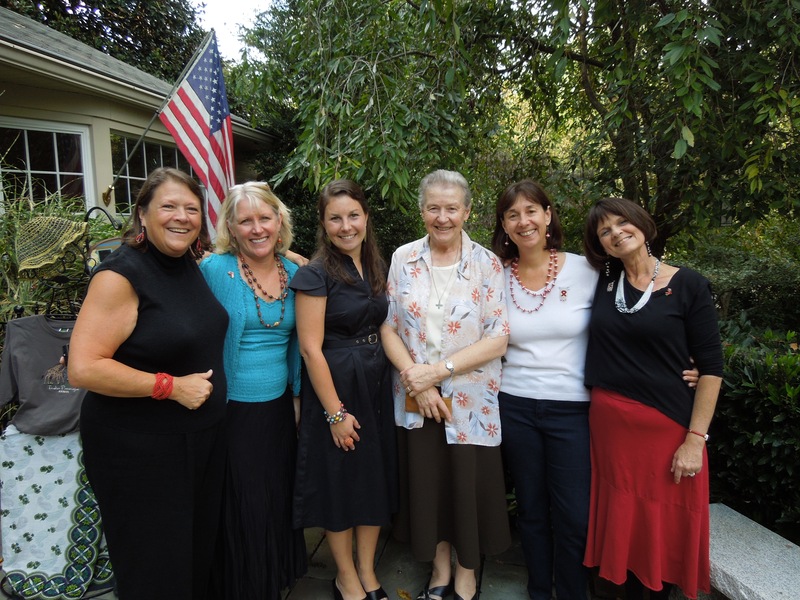 These are wonderful groups of very lively vibrant women who each have incredible stories to tell. Every story is captivating but I have to say that Sally of the Vision Self Help Group had the most powerful story because she has been HIV+ since 1991 and has a daughter who is HIV+ as well. 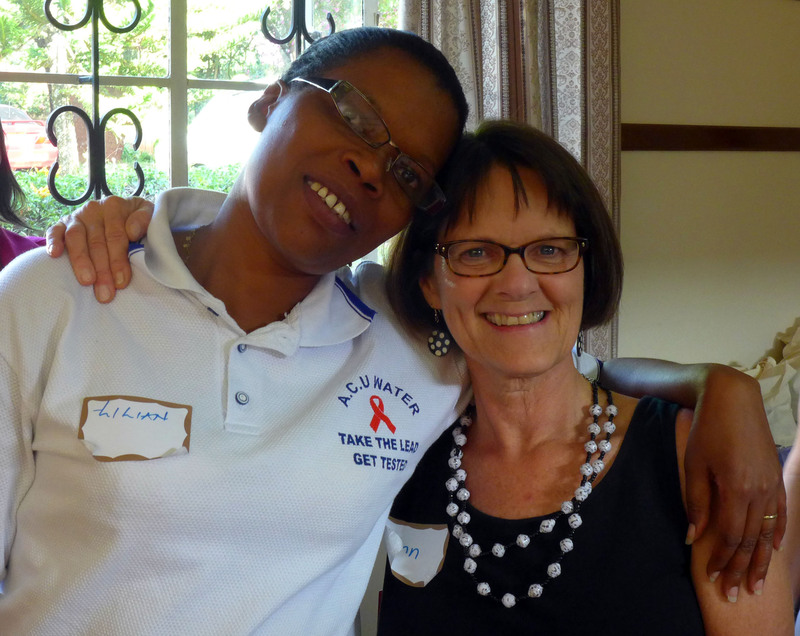 She has a strong powerful voice and is incredibly articulate about living positively with HIV and a powerful commitment to bringing that message to others. 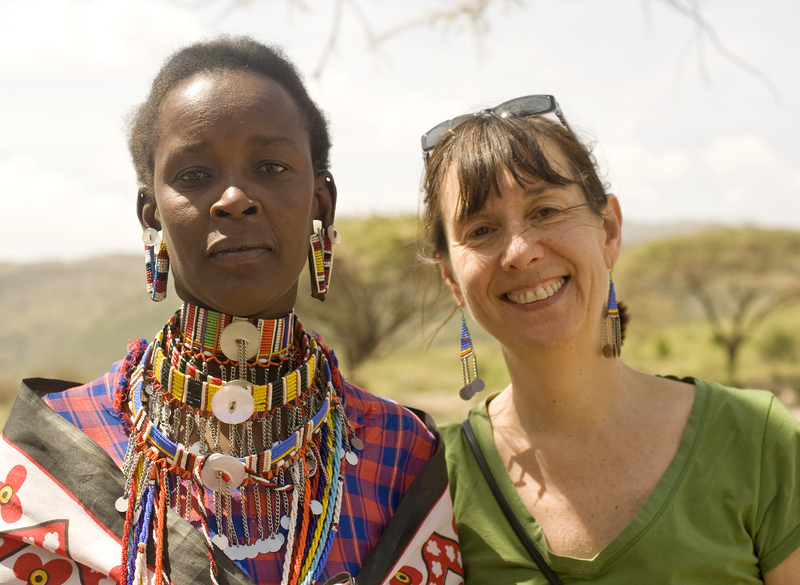 (I made a deal with her that next time I come to Kenya I will do a video interview because she has a voice and a story that really should be heard and can speak for many others). We also had the mission of meeting with representative Self Help Groups in the three sites where Lloydie explained that it has often felt difficult for volunteers to feel like they are really able to be helpful in the Lea Toto sites and that KEST has taken on a new initiative to support those communities by supporting the Mommas of these groups. 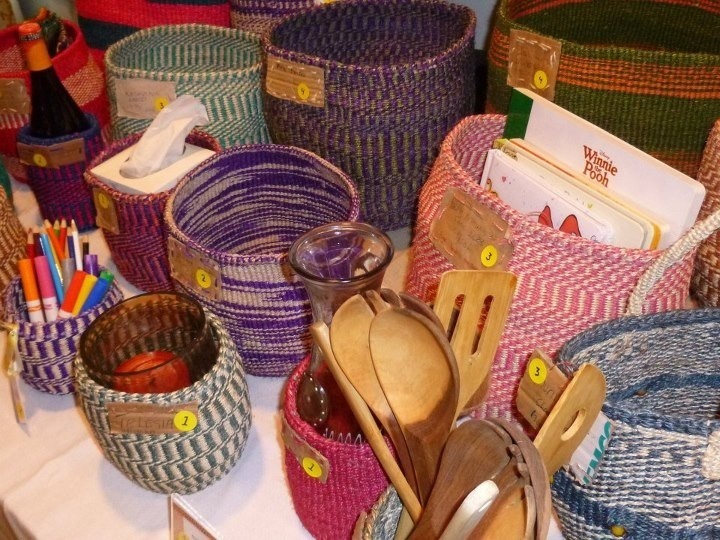 She explained the plan to select from their crafts items to be considered for sales in the US and that when she returns in June she will place a larger order for these items and pay fair market value when she gets them in August. Then KEST volunteers will sell them in the US and the additional profit will be brought to them next January and the cycle will repeat and hopefully grow. This plan was met with overwhelming enthusiasm and gratitude. As always, there is so much more I could say, so many more words I could use, but words can’t capture this…..
It’s after midnight here, please pardon my typos, no more energy to proofread and a busy day tomorrow….kwaheri from Kenya! 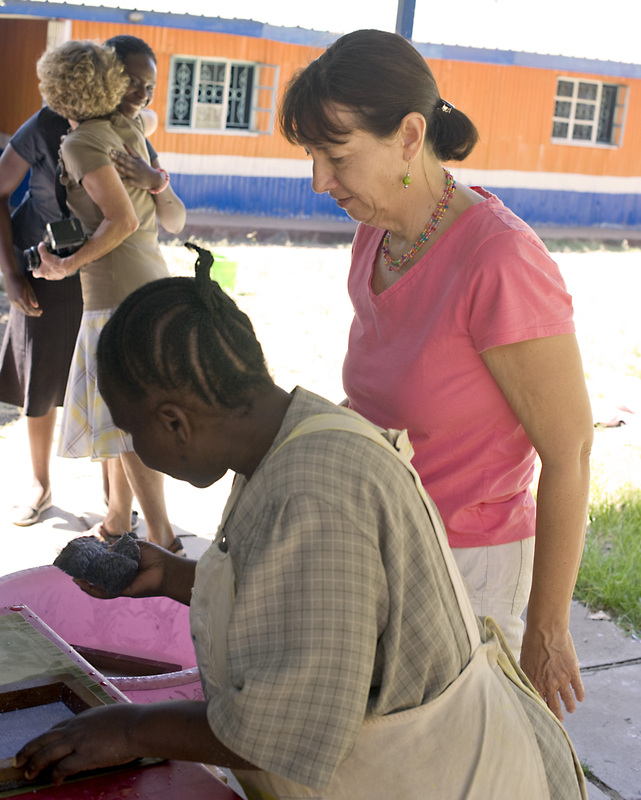 The Kazuri Bead factory is a place not far from the Children’s home that we stopped on the way back from one of our days at Lea Toto. 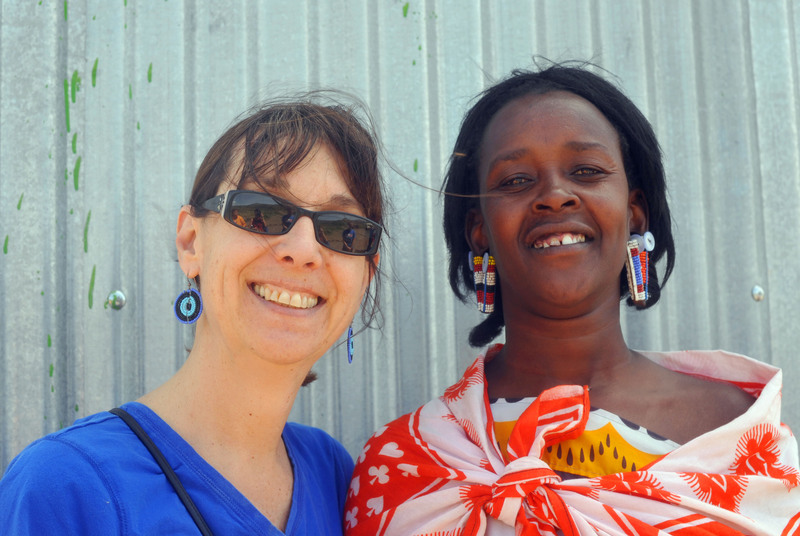 It is now a company that has about 350 employees but first began when one white woman wanted to create a way for impoverished Kenyan women to support themselves. 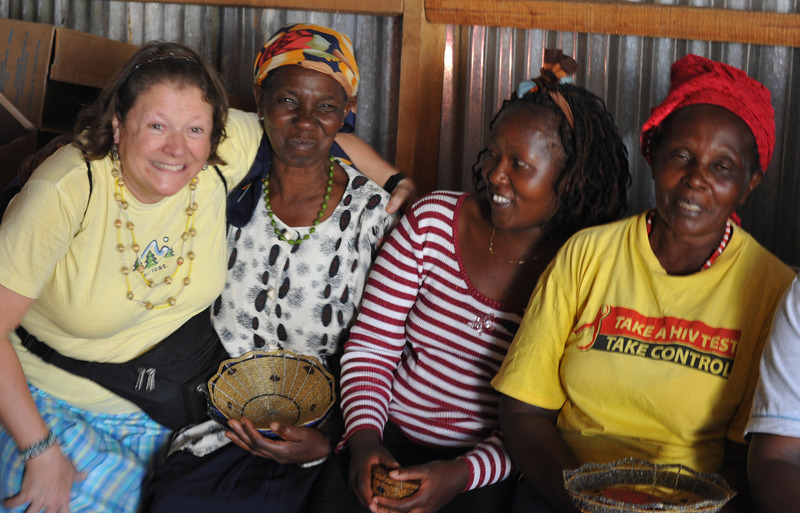 Since Lloydie, our trip leader often takes travelers there and is a frequent visitor (as well as being one of the friendliest people in the world), she has developed a relationship with the “Mamas” who make the beads. 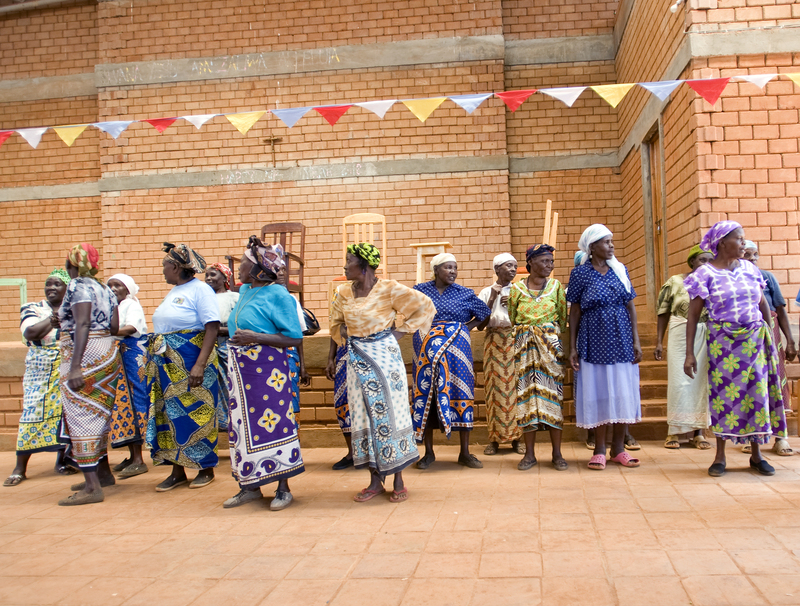 When we arrived for our tour there was immediate excitement and with the support of the management in this incredibly worker friendly environment, all the women broke into song and dance as a special welcome for us. We have had a lot of special welcomes since as Lloydie’s friends we have been instantly accepted and welcomed in the most enthusiastic ways. After some singing and dancing, and handing out of candy to the Mamas, we went on with the tour. We learned about the making of the beads, which are beautiful, but also of a work environment that is incredibly supportive, offers onsite childcare and medical care, transportation for workers, rotates the work assignment daily to keep in interesting, and has a value system that is dedicated to employing single mothers, and the disenfranchised. What struck me the most was that it was the happiest workplace and that the women had a so much pride in their work. It is a wonderful model of a socially responsible company dedicated to its community, most especially mothers.